Another dry day, what a treat. 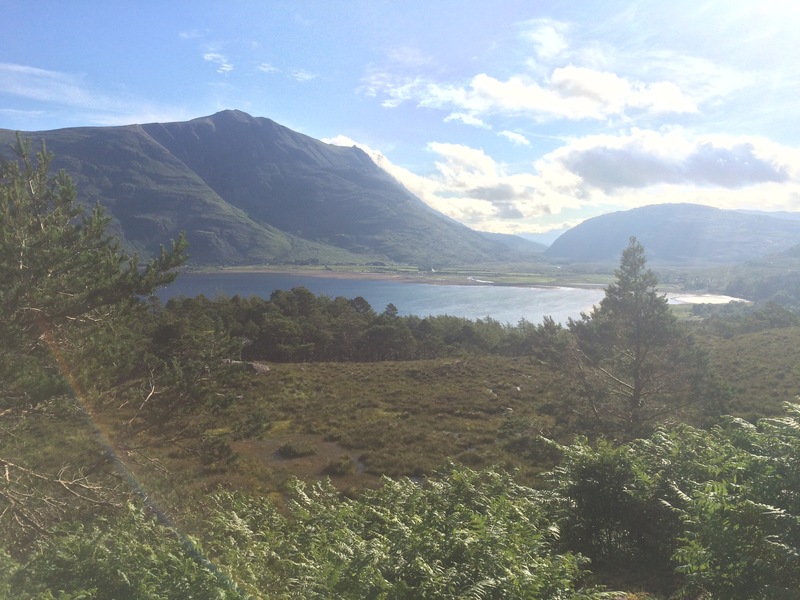 I have new maps and no forward planning to include any walking so I just headed off down Glen Torridon with the intention of driving the Applecross scenic drive. This is a huge Valley, with big mountains on both sides. The views are more open now than they were further North, and dominated by mountains. I have seen plenty of mountain hikers the last couple of days; two stayed in the bunkhouse last night. 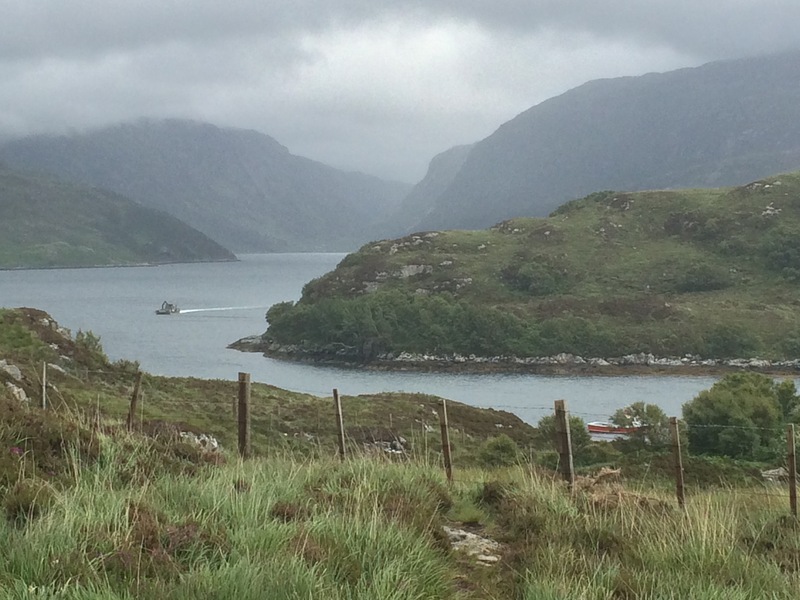 From Torridon it was up and over to Shieldaig and the start of the scenic drive. It was indeed a fun road to drive and looked like a challenging one to cycle. Following the shoreline of Lochs Torridon and Shieldaig (essentially the same piece of water but with land jutting out to provide a sort-of separation) the road went up and down very sharply. 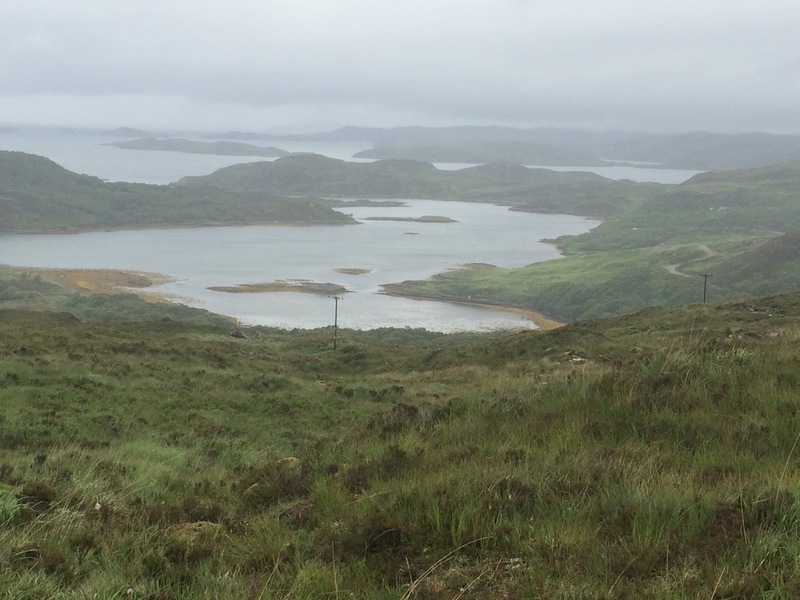 here were some great views of small off-shoot lochs that provide sheltered harbours for small boats. 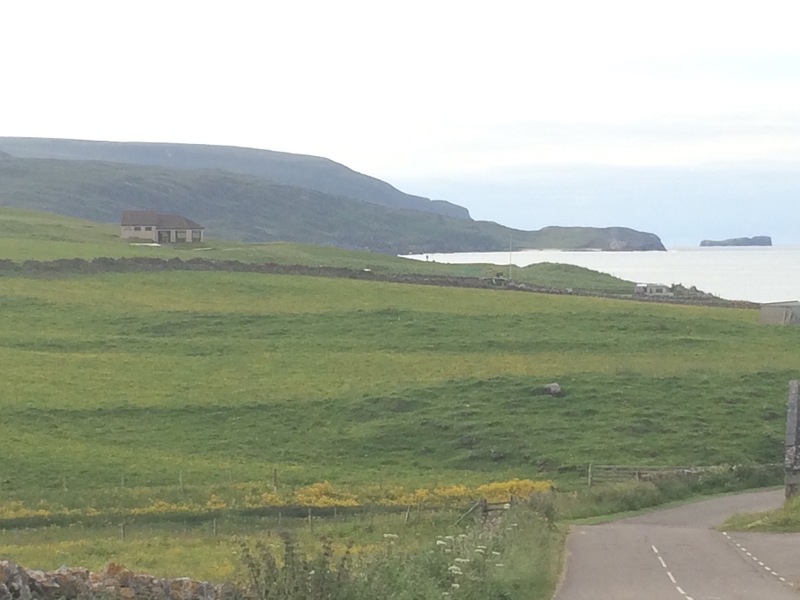 At Fearnmore the road hits the coast proper, opposite the Island of Rona and the Isle of Skye behind it. 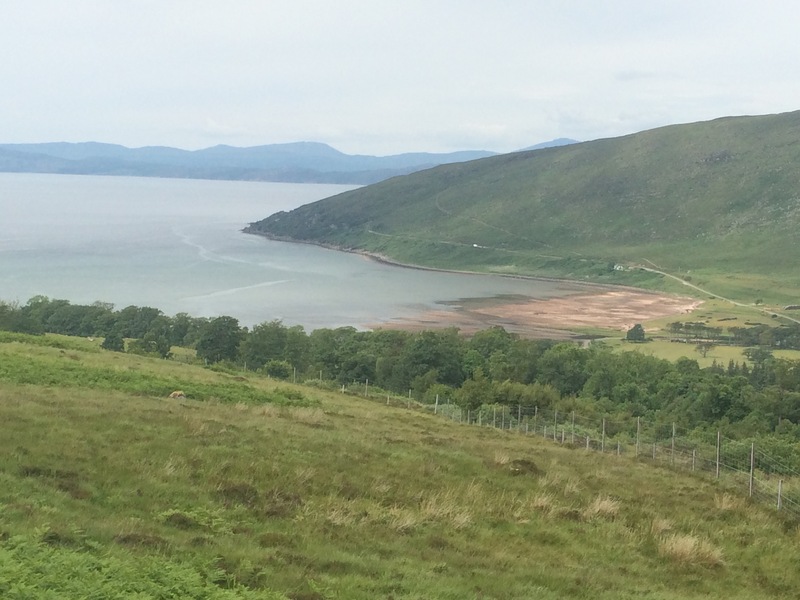 No wonder Applecross is a popular place as Applecross Bay is large and enjoys the good views. Yesterday was the Applecross Highland Games and so there were lots of tents everywhere, although not so many people; I guess they all had hangovers! It’s a nice looking town and is apparently well known for its music festivals. 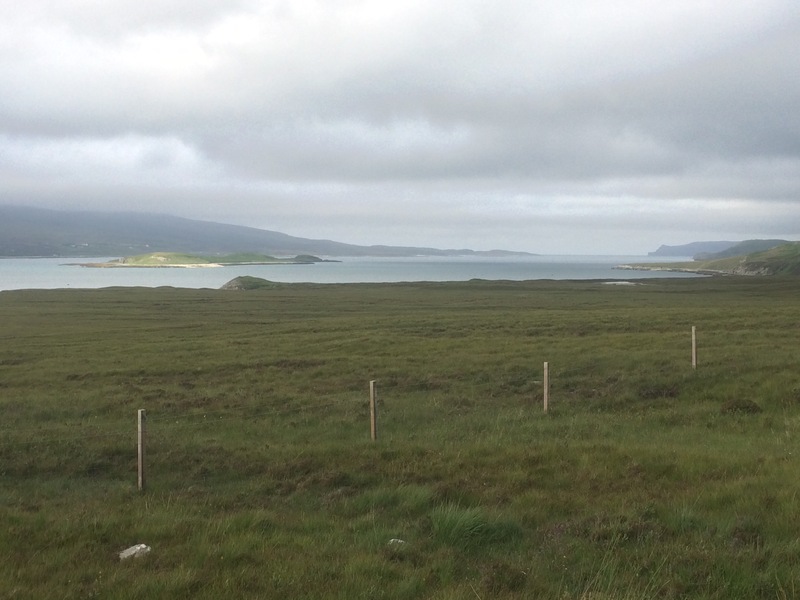 I drove on to the furthest point of the road at Toscaig and stopped at the pier. I struck up a conversation with 4 bikers, one of whom was fishing. They come here a lot for the peace and quiet (and the music festivals) and I can see why. It amazes me just how many houses I passed on this road to nowhere, smart houses with smart cars outside. I don’t know what these people do for work but they’re not short of money! 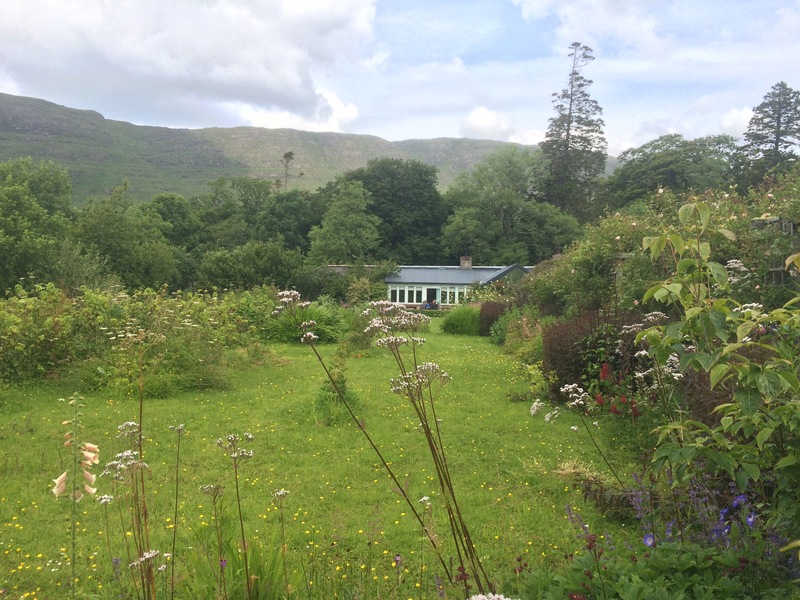 The bikers recommended I pop in to Applecross House Walled Garden, which has a lovely restaurant and does good breakfasts. I had the best smoked salmon and scrambled eggs on toast that I’ve ever had. I hung around for 2 hours as it was the first ok-ish wifi I had found for days. Eventually I left and the 2nd half of the scenic drive was the closest I’ve come to an Alpine pass in this country. The road rose from sea level to about 650m and the views were amazing. Unfortunately it was a little bit cloudy so not good for photos. I think I could see almost all of the islands of the Inner Hebrides, including Raasay, Scalpay, Skye, Mull, Rum and Eigg. Wow. 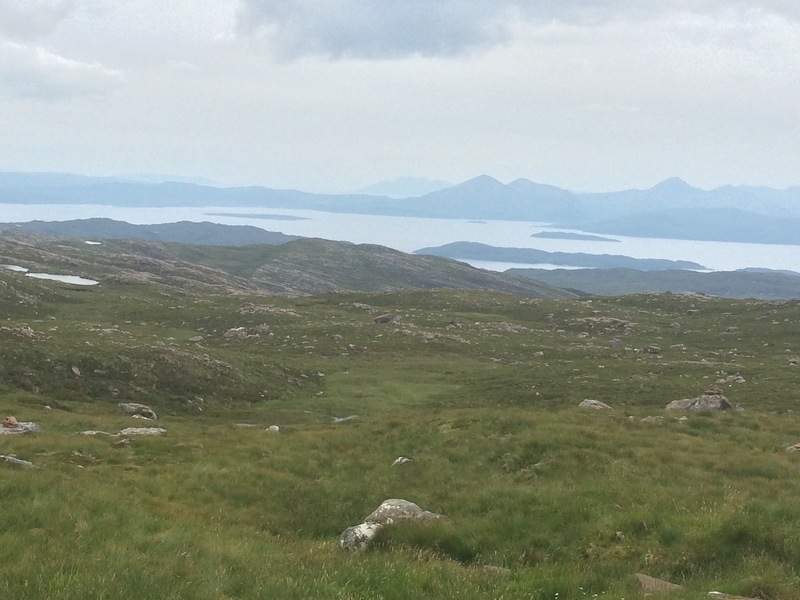 It didn’t end there because as soon as I dropped over the other side of the pass I was staring down at Loch Kishorn, Loch Carron and all of their respective small islands and inlets. The road did a couple of severe switchbacks and then dropped down a steep but wide valley that itself was really beautiful, even without the views. 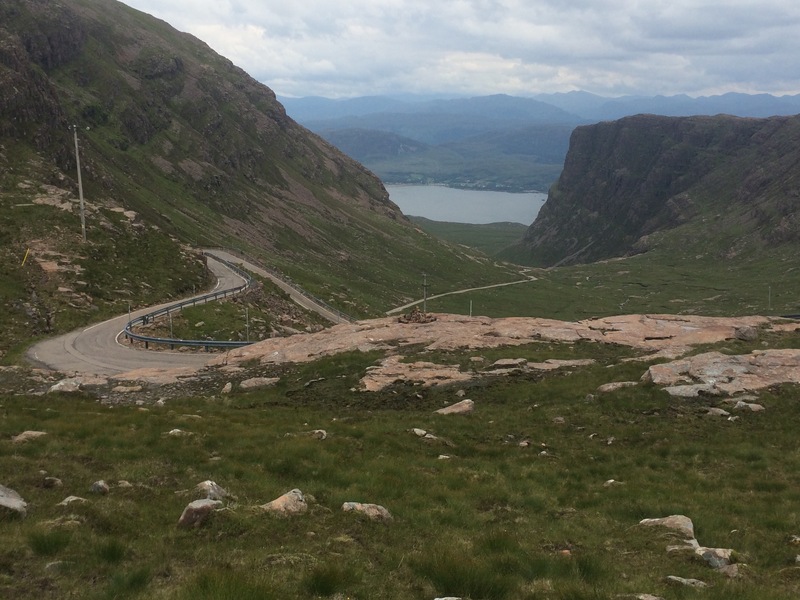 Is this an Alpine road down to Loch Kishorn? I passed some cyclists struggling up and felt compelled to shout encouragement at them because that would be a tough ride. 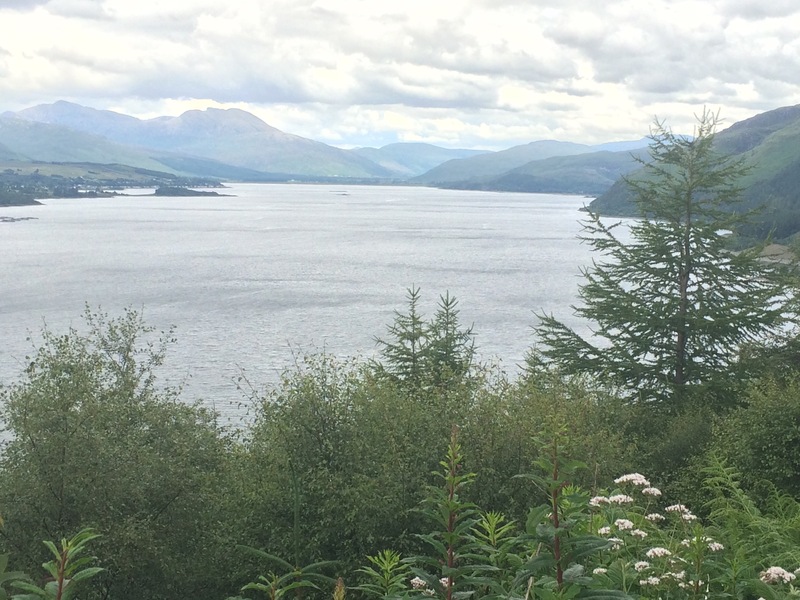 Loch Carron is beautiful. 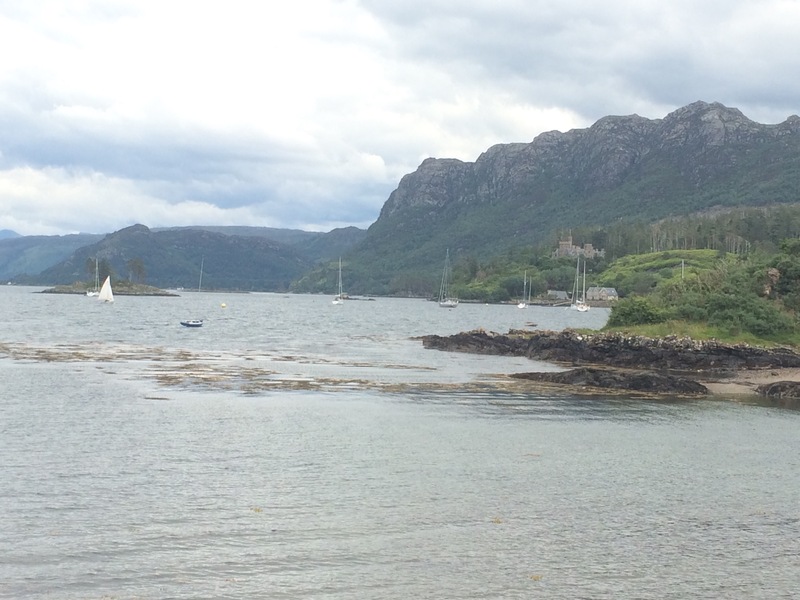 It is bordered by lots of woodland and the area around Plockton in particular is just stunning. 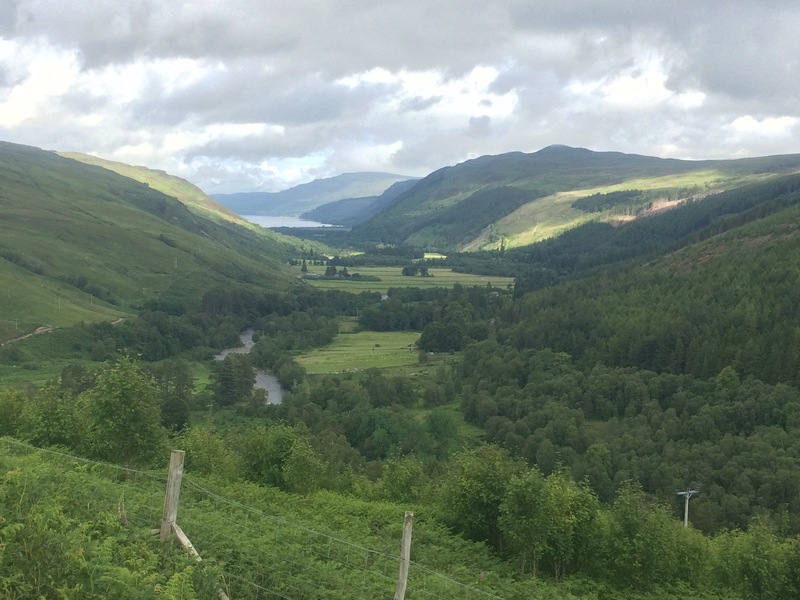 The train line to Kyle of Lochalsh goes right along the loch and must provide great views for the passengers. 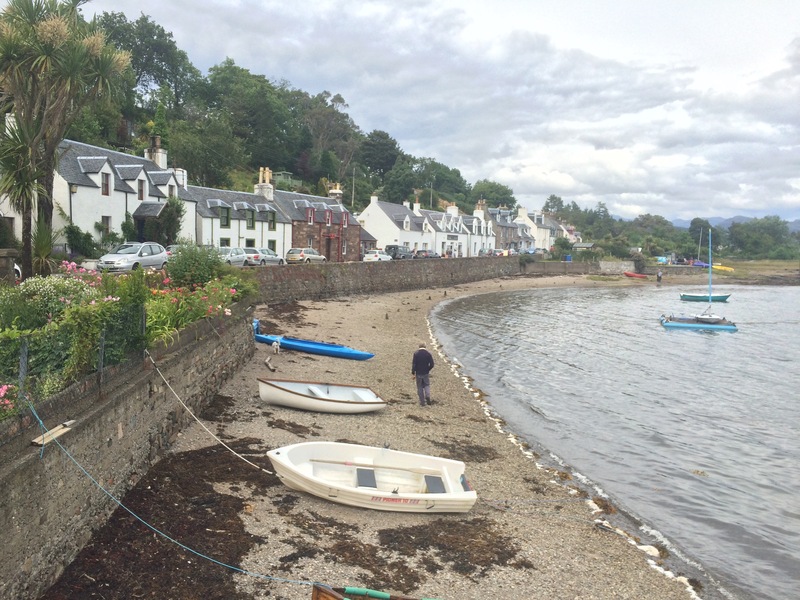 Plockton itself now seems to be a tourist Mecca and has that typical quaint feel about it. Nothing like its past when it was developed in the early 1800s as part of the Clearances. It used to be known as the “village of the poor”, but definitely no longer. 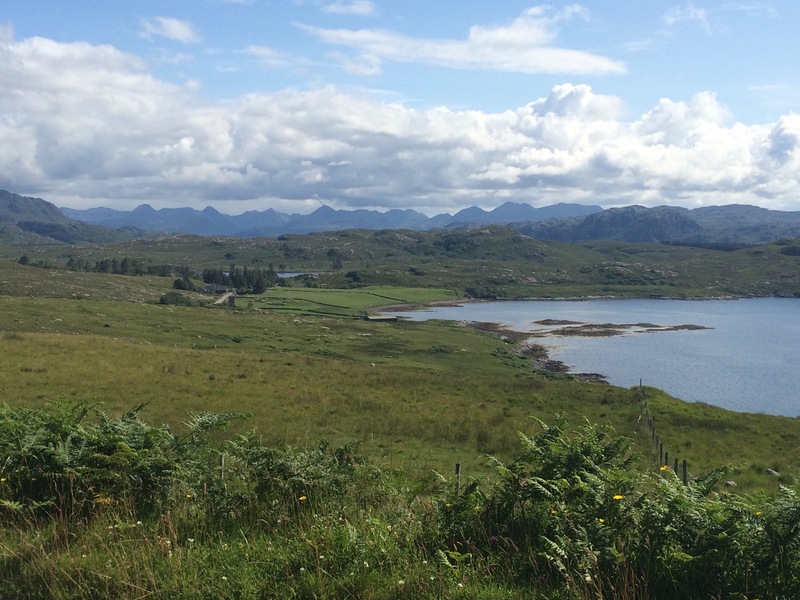 The area around Plockton is part of the Balnacara Estate, owned by the National Trust for Scotland, and developing new crofts; there are 83 on the estate. 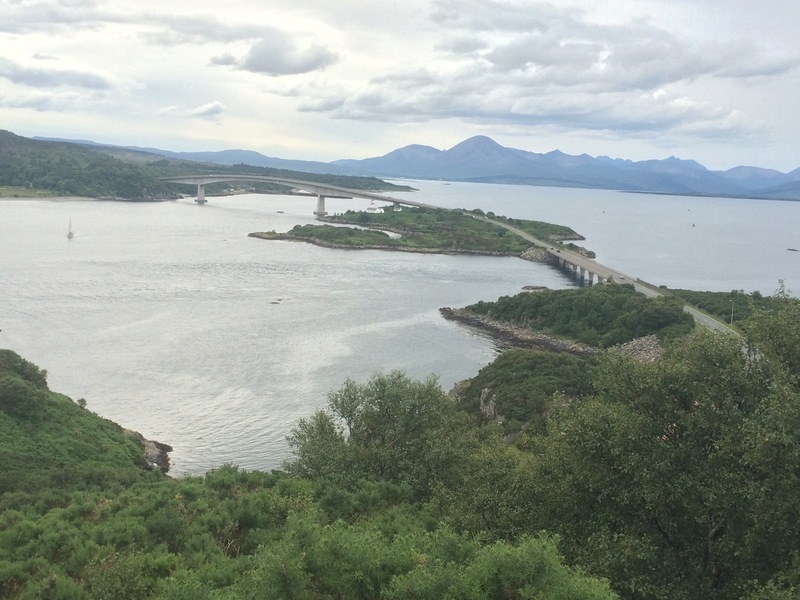 The next stop was Kyle of Lochalsh, the gateway to Skye. I stopped to admire the bridge, only built in 1995 and before that it was a ferry. 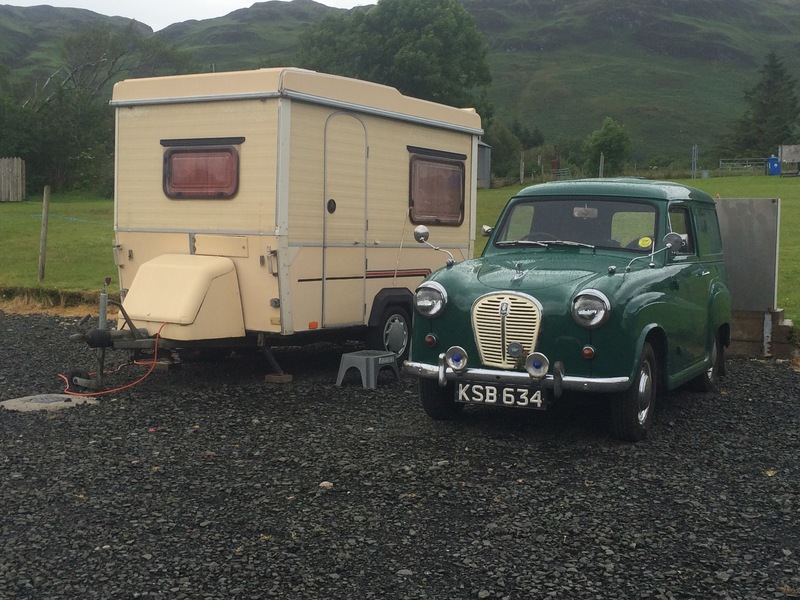 The nearest campsite was just down the road at Ardelve, right by the Eilean Donan Castle. I hadn’t long pitched my tent when the rain finally arrived from England. I headed across the Loch Long bridge to The Clachan Arms in Dornie. It was pretty full (mostly with foreign tourists) but being on my own they could squeeze me in and I ate at the bar. Excellent food, particularly the chocolate and salted caramel torte. I really need some exercise! It had been such a beautiful evening, sunny and warm, that it was inevitable the midges would come out. It rained a little through the night but I slept well for once and when I woke up there were midges all around the tent clamouring to get in. A good time to sleep some more! They finally went away and I got up just after 9 am – a really long lie in for me. Tent was packed in no time and I stopped at the cafe for a cappuccino (another place with a coffee machine and Highland stoneware crockery). The sun didn’t come out until almost lunchtime, which seems to be the way up here: the better weather is in the afternoons and evenings. As a morning person this is not good news. 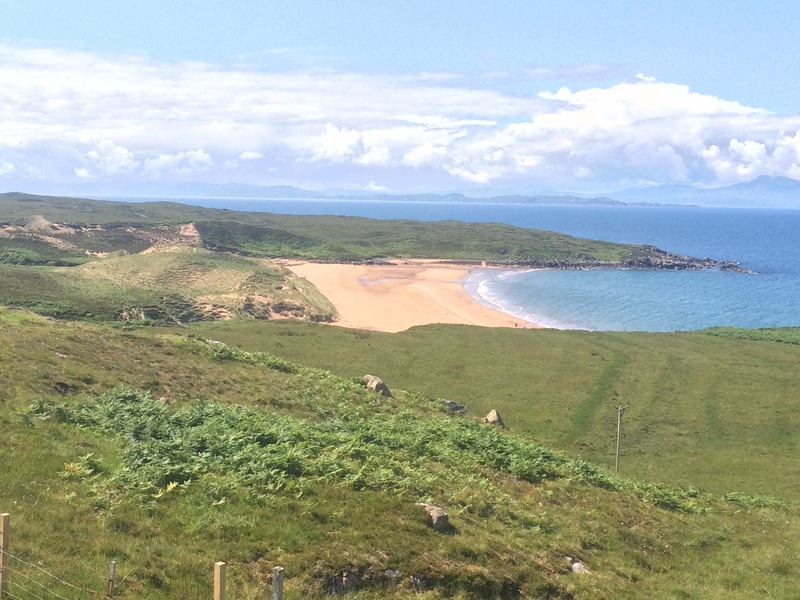 I drove up the North side of Loch Gairloch first, just to see the sights, which included a fabulous view of the sea along the coast. Once I reached the end of the public road I turned around and headed back through the town and along the South side of the Loch. Gairloch town seems quite well established with shops, cafes and plenty of other amenities (I even saw a dentists). 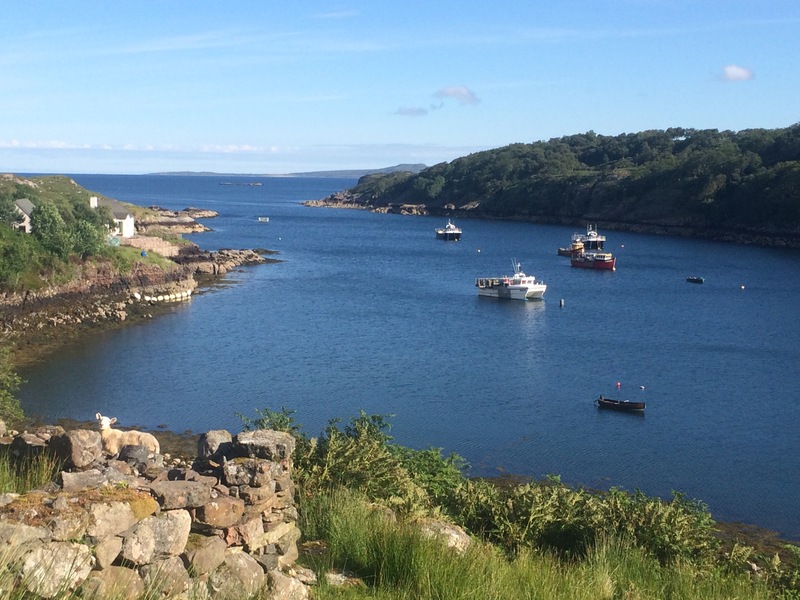 I took the minor road to Red Point and immediately passed a couple of harbours for small boats that were essential small lochs on the side of Loch Gairloch. Very picturesque. 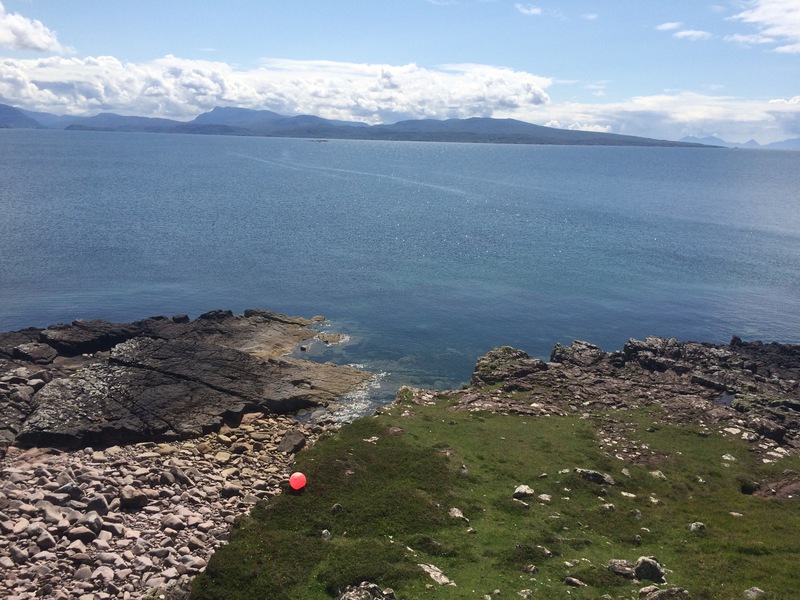 Red Point is a small headland with a beach either side of it. 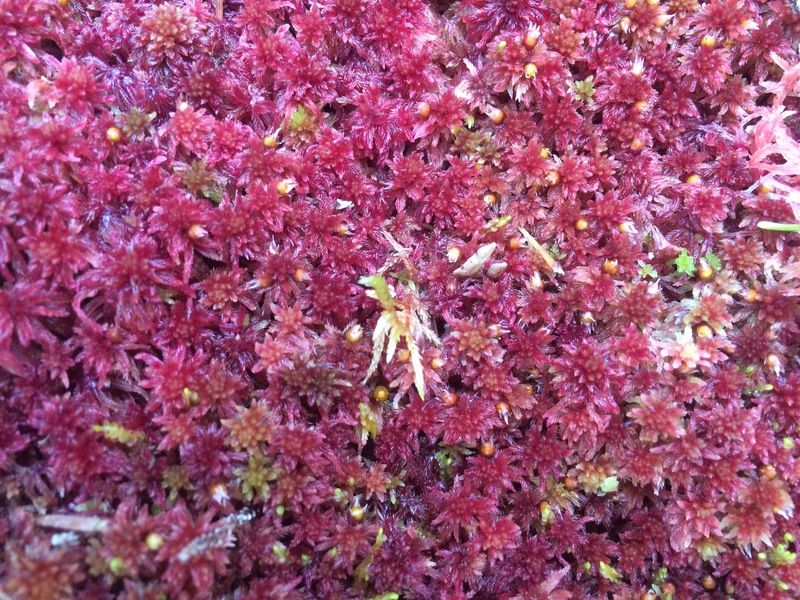 I wondered if it got its name from the red tint of the sand and the deep red of the streams that flow here? The first beach had one family and one couple on it so they must have been fighting for space. The sun was out now and I walked down to the first beach and then around the headland. It was such a lovely day that I was looking for somewhere to take a dip that wasn’t the beach. 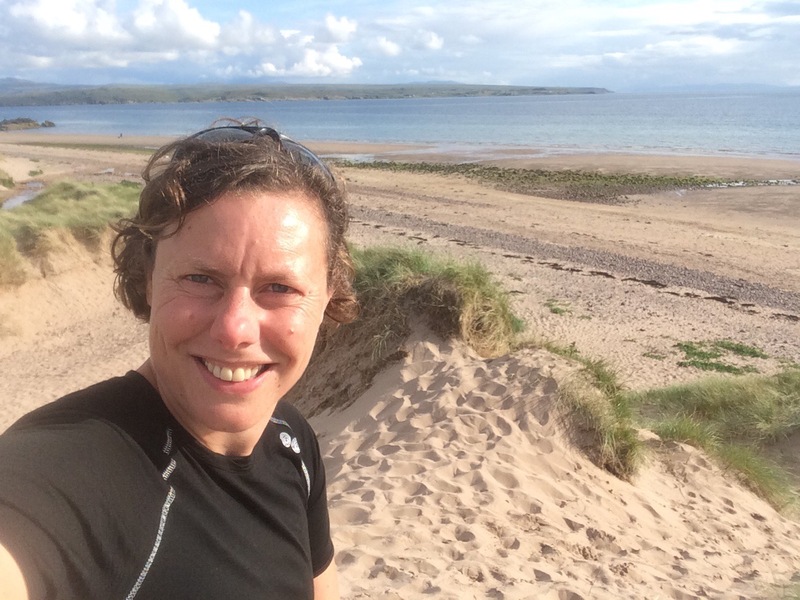 This is what I naively imagined my trip down the West Highland Coast would be like: stopping at deserted beaches for a swim in the glorious sunshine. The water was easily accessible at a number of places by walking down a steep grassy slope and clamouring across the rocks. I eventually picked my spot. What a beautiful spot for a swim! No need to get a swimming costume wet around here! 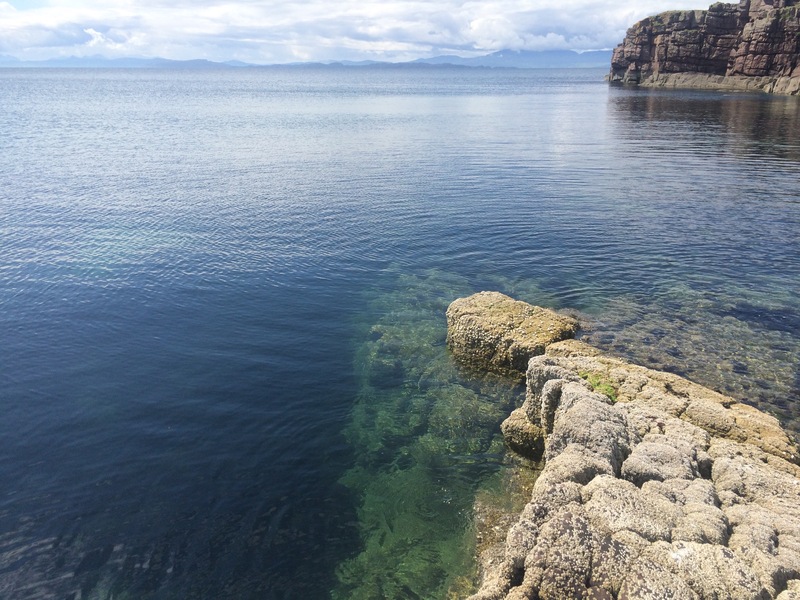 The water was stunningly clear and not as cold as I thought it might be, and the views of the mountains, Skye, the Outer Hebrides and the Island of Rona were just fantastic. I swam around for a good 5 minutes before climbing out and dripping dry in the sun. Not another soul around. Perfect. I hung around and ate a picnic lunch (smoked salmon rolls again). The clouds started rolling in so it was time to walk back to the car. I took the direct route, across the bog. There was supposed to be a footpath but I never found it (there’s a theme here as I never seem to be able to find the footpaths). It was hard going trying to find a route and I definitely don’t want to get rid of the car until I can be sure I don’t have to do this every day. Eventually I did sink right in and got a wet foot. I came across a sheep carcass in a mud pool; the animal probably sank and couldn’t get out! I could see my car but couldn’t get to it, it was highly frustrating and nearly ruined my day. I did see a couple of red deer to keep me going. Eventually I made it back and enjoyed the drive back to Gairloch and along the length of Loch Maree, a large inland loch. 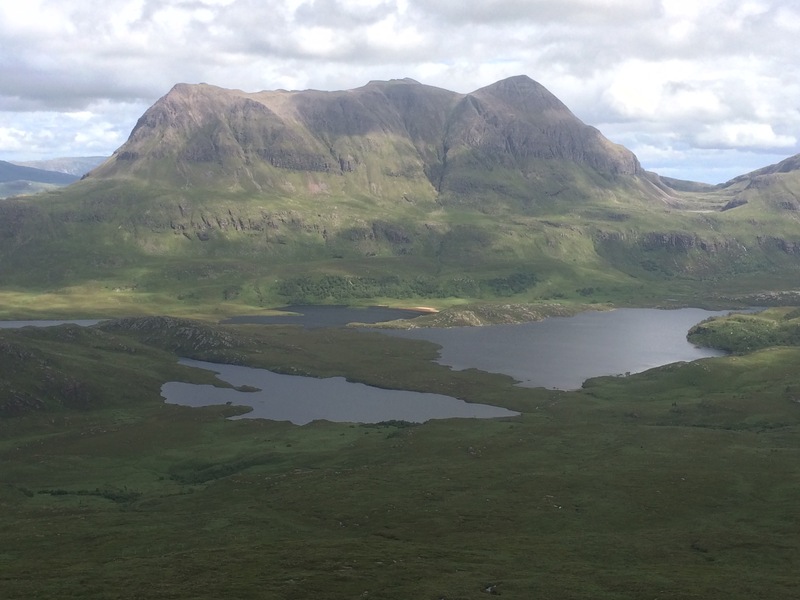 Near the South end I stopped at Beinn Eighe, Britain’s oldest National Nature Reserve. 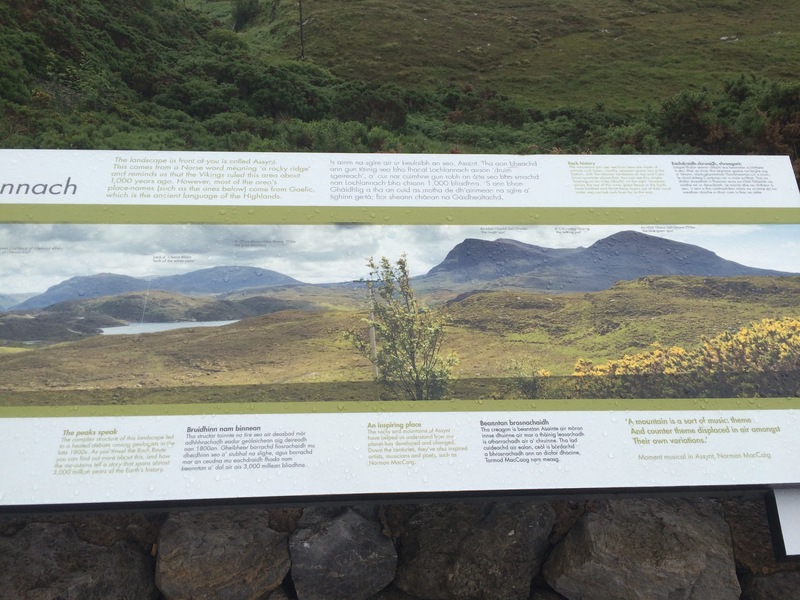 It was set up in 1951 to protect the largest remnant of ancient scots pinewood in the Western Highlands. 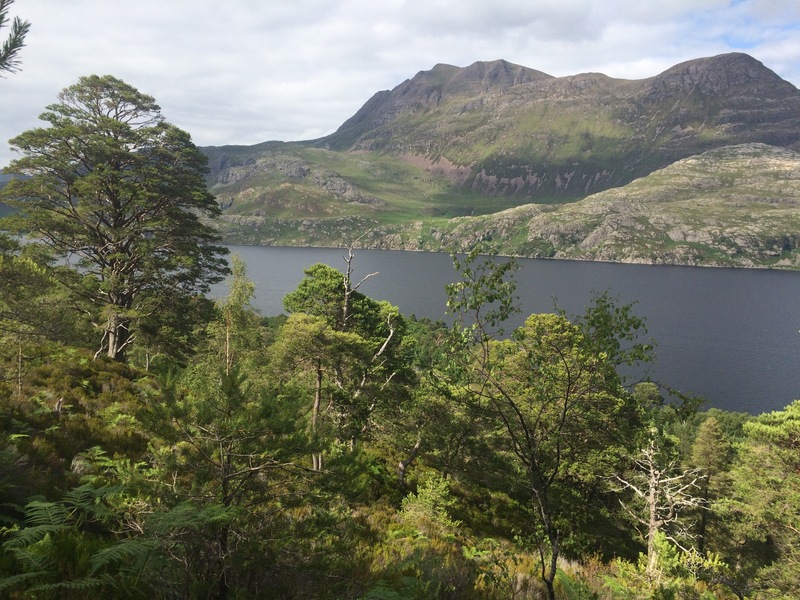 I walked up the lower slope to the viewpoint across Loch Maree. It was gone 5 pm and I had nowhere to stay and had suffered from lack of phone reception all day to search the internet. 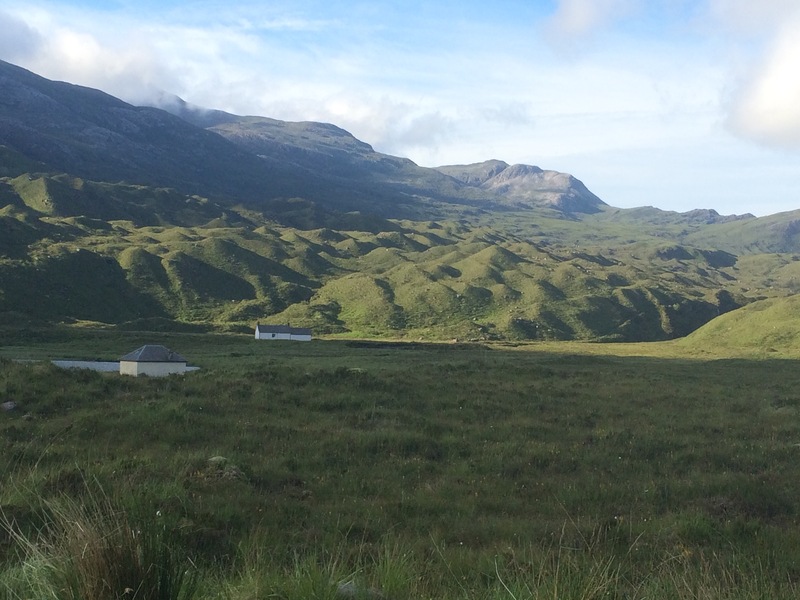 From Kinlochewe I headed along Glen Torridon to see if I could camp in Torridon. 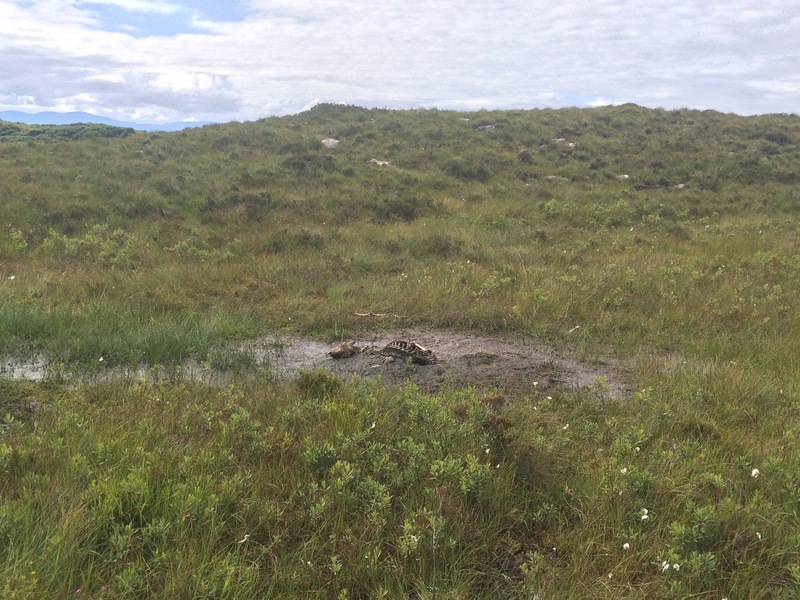 There was a free campsite here but it was essentially a bog with a few tents occupying all the dry patches. Hmmm. I tried the Youth hostel, but that was full. 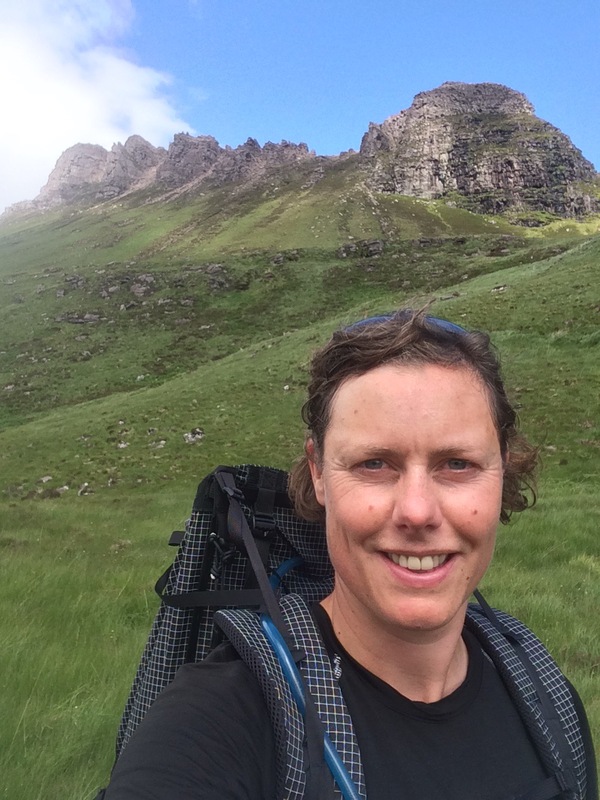 I didn’t fancy wild camping so I headed back to Kinlochewe and ended up in the overpriced and pretty grim bunkhouse attached to the Kinlochewe Hotel. It was only for one night and it meant I could eat in the hotel and use the wifi…well only after 9 pm for guests and even then it was incredibly slow and wouldn’t allow me to upload photos. The lack of connectivity is making it very hard to keep up with my blog. I slept for 8 hours, in proper bed. It was wonderful and I didn’t want to get up. A big thanks to Donna for my night of luxury and the enormous breakfast. I resisted a wee dram on my porridge but it sounded interesting. It was raining again, but the sky was lighter and the rain wasn’t going to last. I left late and went via the post office (to collect a map delivery) and the bakers for some fresh bread rolls. 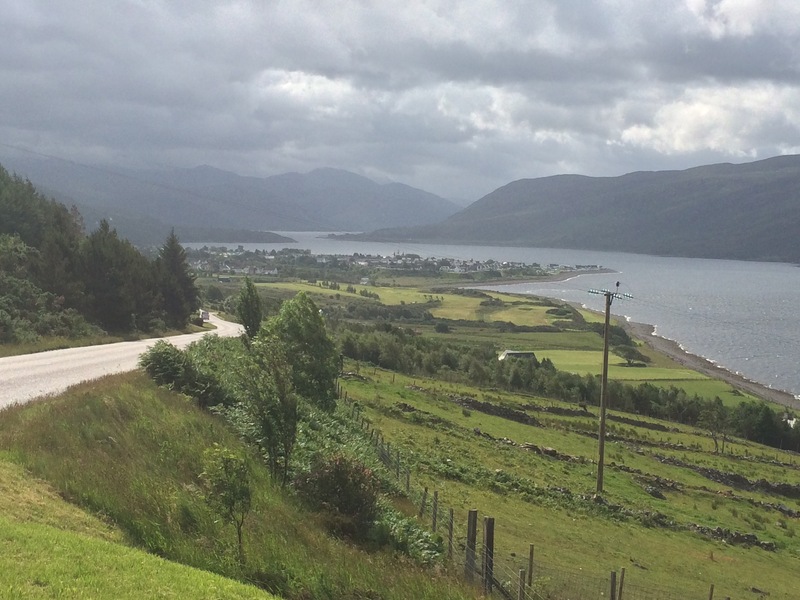 I left Ullapool and headed down to the head of Loch Broom. The road followed the River Broom inland to the Corrieshallock Gorge, which is a very impressive gash through the rock caused by the ebb and flow of ice during the ice age. 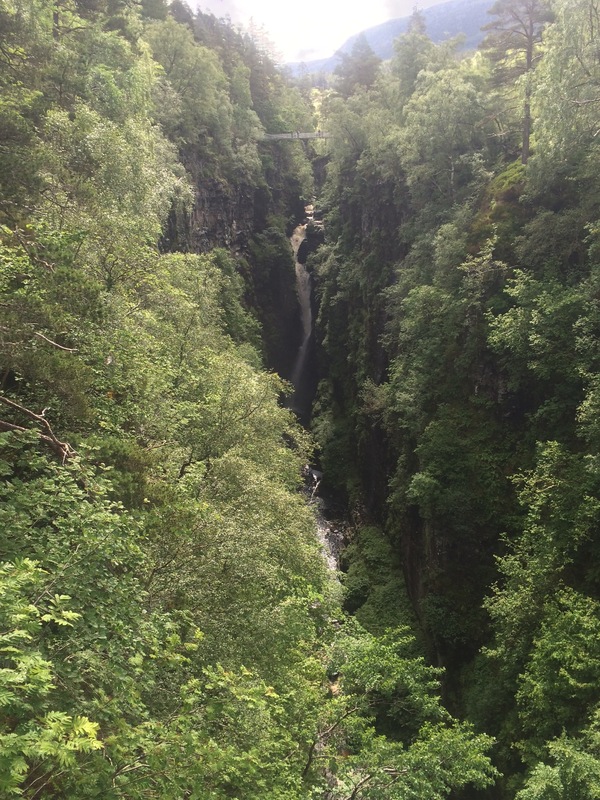 There is a short walk you can do that takes in a bridge across the Falls of Measach and there’s a viewing platform. By now the sun had come out and it was pleasantly warm; time for the midges to make a brief appearance! 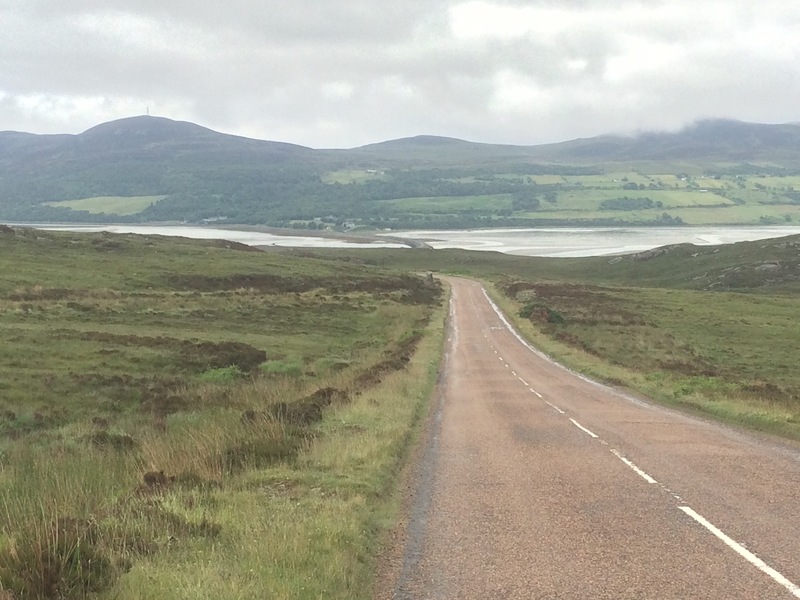 The road headed back to the coast via the Dundonnell River and Little Loch Broom. I was sandwiched between the Loch and the An Teallach mountains until all of a sudden I rounded the corner and there was Gruinard Bay. 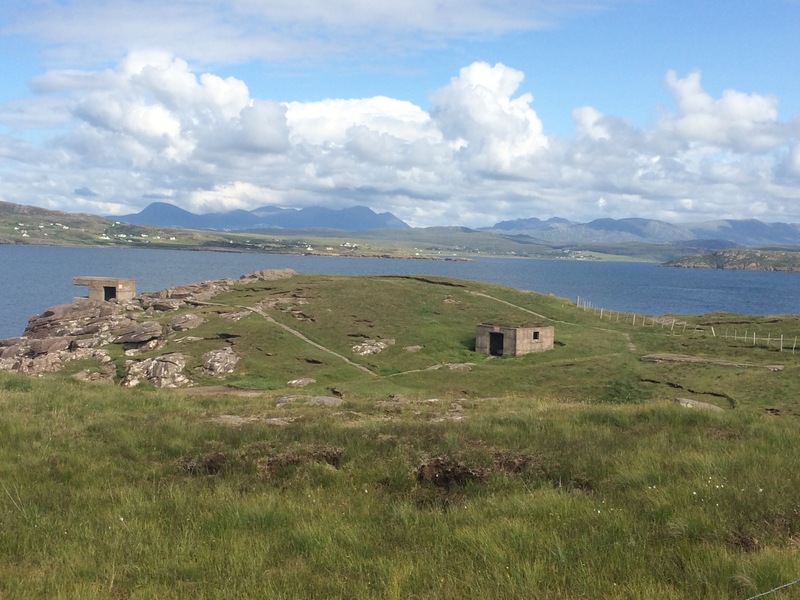 Gruinard Island sits in the middle of it and was where Anthrax was trialled; the island has only recently been cleared for humans again. 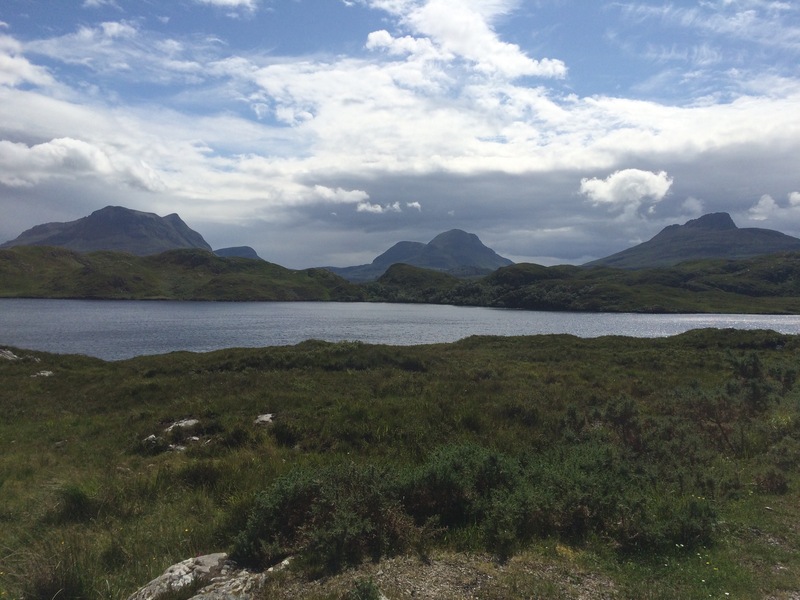 Driving South from Ullapool I noticed a change in the landscape: it seemed to become less like rocky lumps and there are now huge lochs with big mouths open to the sea. 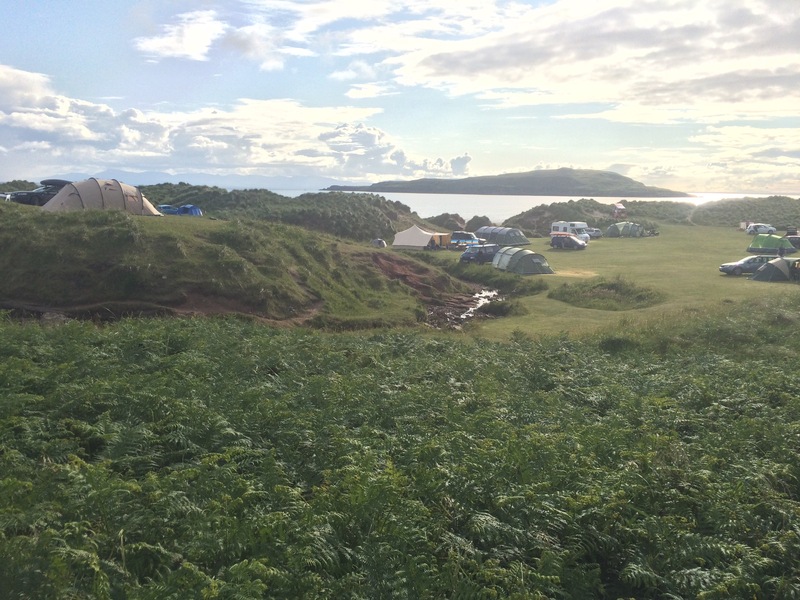 There are more sandy beaches and some great-looking campsites right on the edges of them. There also seems to be a bit more money in this area as the crofters cottages are taking on all forms of grand designs, having mostly been done rather smartly. The roads are suddenly wider and some even have white lines down the middle, bit there are fewer cyclists as Ullapool marked the end of the Highland Tourist Route. 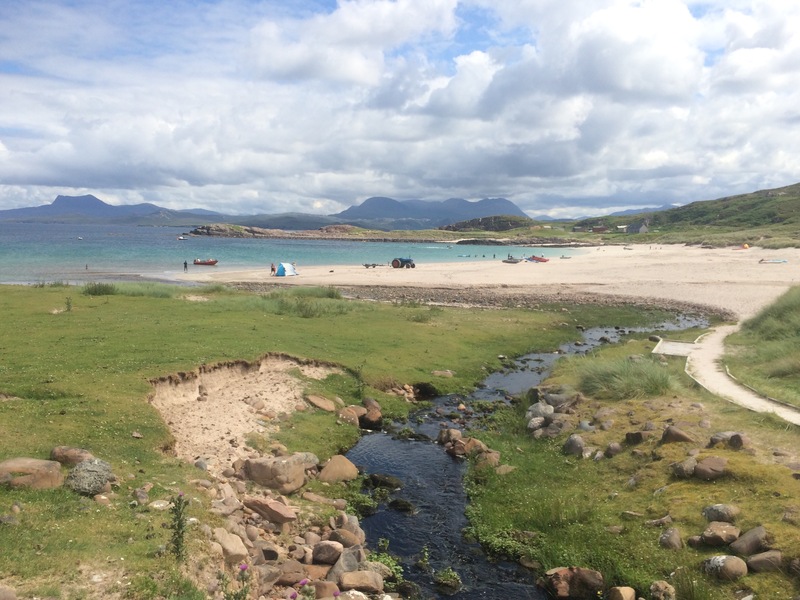 I drove all the way around Gruinard Bay to Mellon Udrigle, which has a campsite overlooking The best beach of the day. This one was simply stunning and there were several families on the beach and in the sea (all wearing wetsuits). The sand was white underneath the crystal clear water. I dipped my hand in and it was freezing! 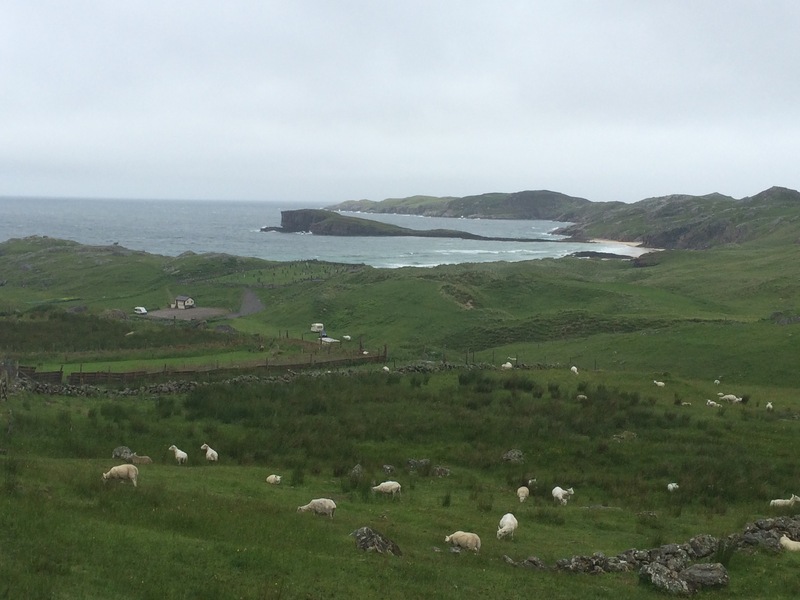 I went for a short walk around the small headland of Rubha Beag. 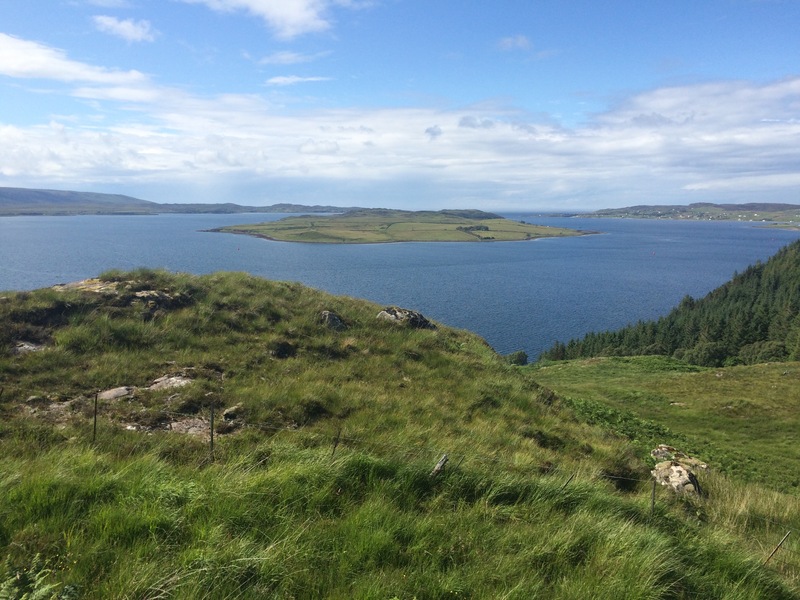 The going was boggy but the views were great; I could see the Summer Isles again and, of course, plenty of mountains inland. 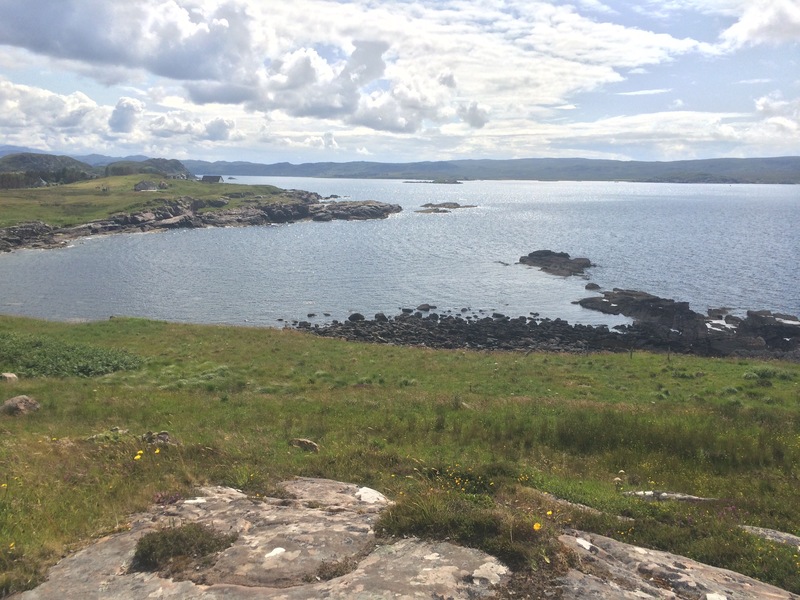 Next up was Loch Ewe, famous as the gathering point for the Arctic convoys during WW2. 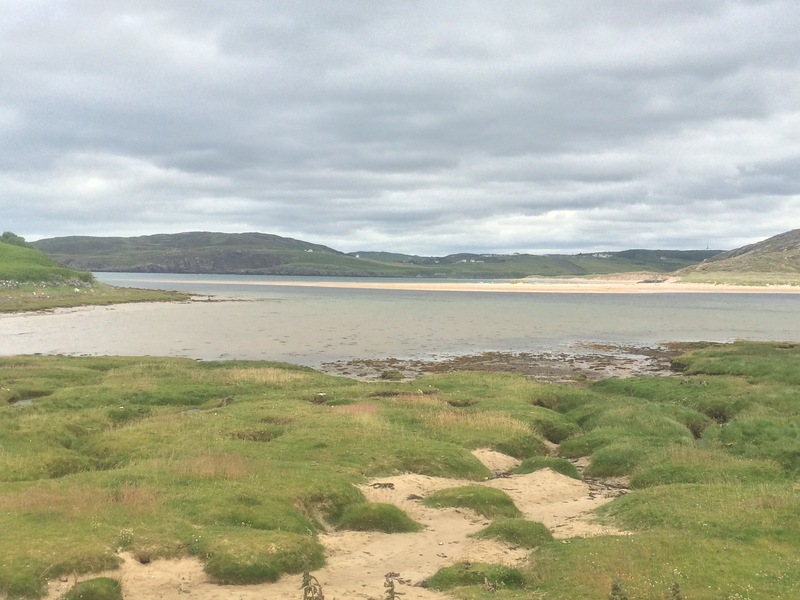 Known as Port A, at its peak there would have been up to 600 ships in this deep water loch. Simply amazing. 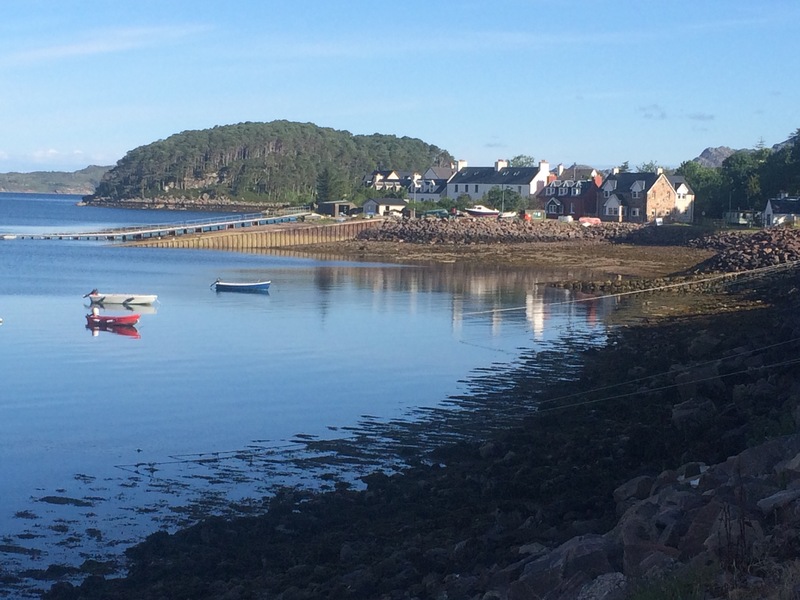 I drove through Aultbea and on to Mellon Charles, a very smart-looking settlement on the East bank of Loch Ewe. I stopped at the Perfume Shop, not for perfume but to take advantage of the Aroma Cafe. It’s definitely more upmarket around here as they had a coffee machine (first cafe I’ve seen with one in the Highlands) and the food was like something I’d get down South (poncy names, emphasis on local sourcing, everything served on a bed of rocket). Naturally I felt right at home! Although that could have been because the manager was a Brummie. The sun was shining and the view across the Loch was stunning in the light. 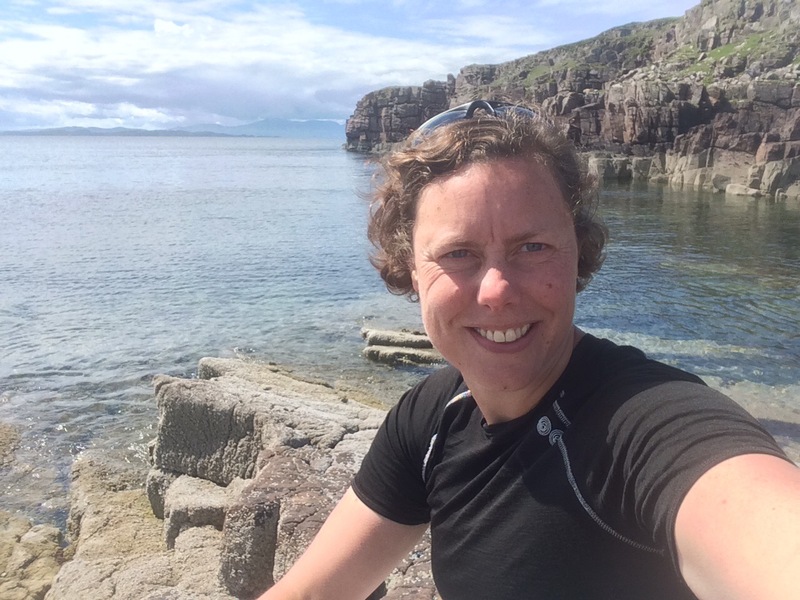 On my circumnavigation of Loch Ewe I stopped at the Isle of Ewe Smokehouse, where I bought some lovely (and expensive) salmon. 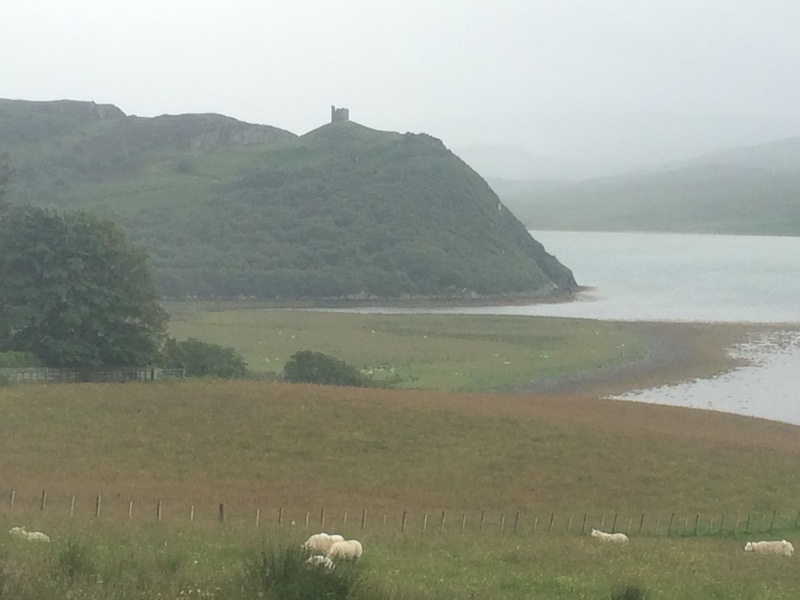 It was a beautiful drive to Poolewe at the head of the Loch, which looked like a bustling little town. 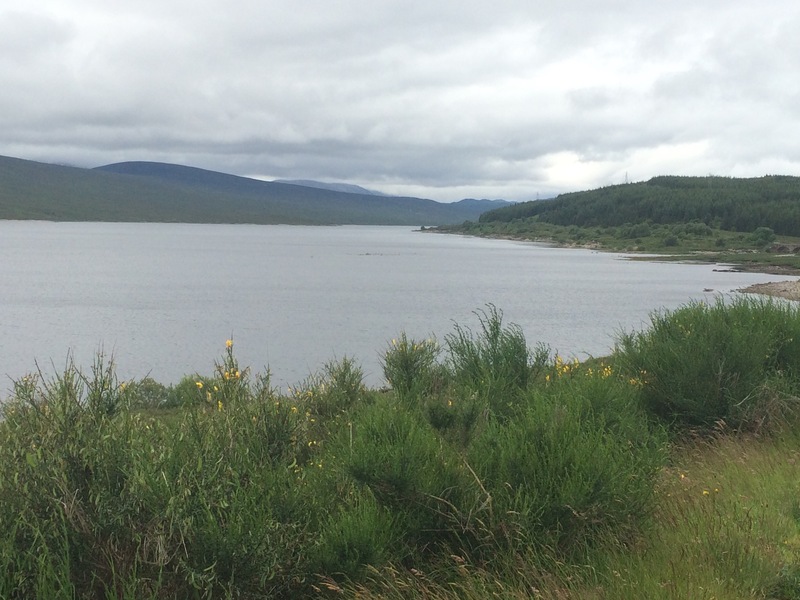 I drove straight through it and up the West side of the Loch. More beautiful beaches (and houses) and then, at the far point, evidence of a military presence in the form of abandoned pillboxes and gun emplacements. 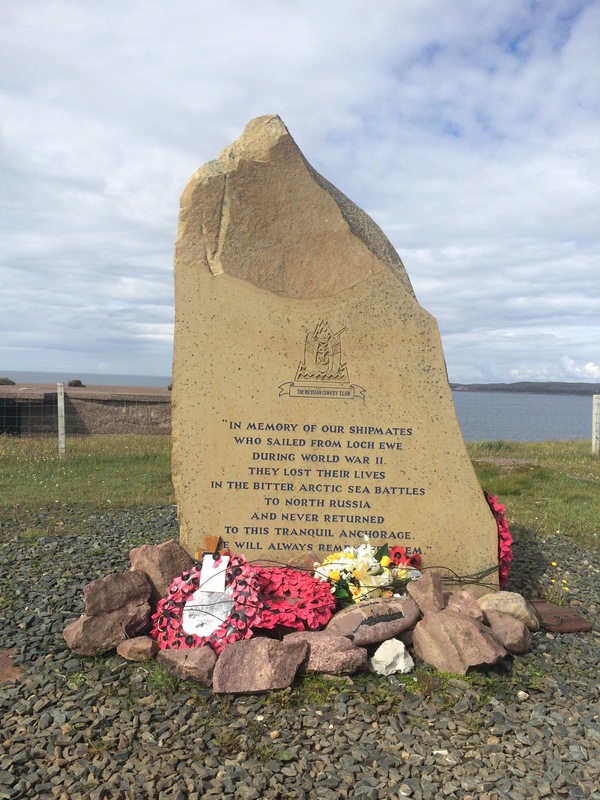 And there was the Russian Convoy Club Memorial. On the way back I took a quick tour around the exhibition that has been created in the Inversdale Primary School (the school has been mothballed due to lack of students). The volunteers were very proud of their museum and are hoping to expand. By now it was 5 pm and I needed to find somewhere to camp. 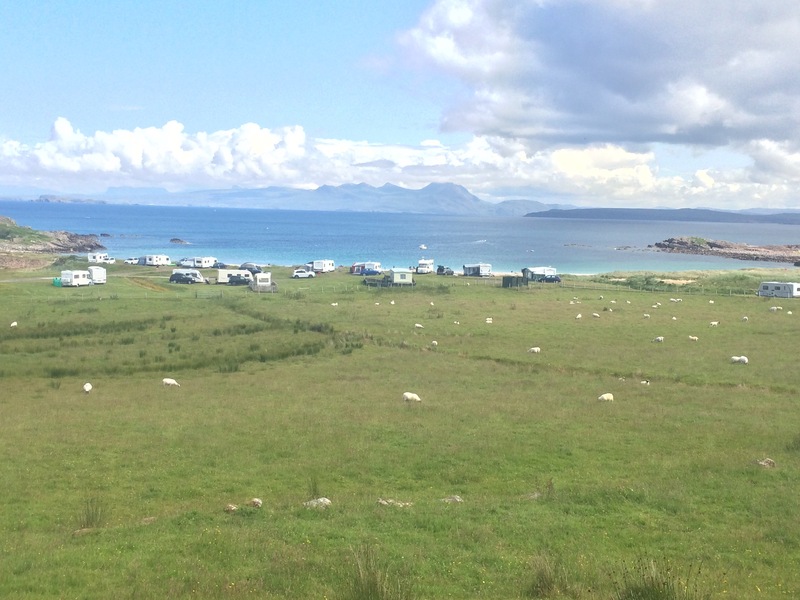 I was heading to Gairloch as the campsite had been recommended by the lady from The Isle of Ewe Smokehouse. To be honest I had passed so many great campsites that I wasn’t sure. However, as soon as I arrived I knew I was going to enjoy camping here. 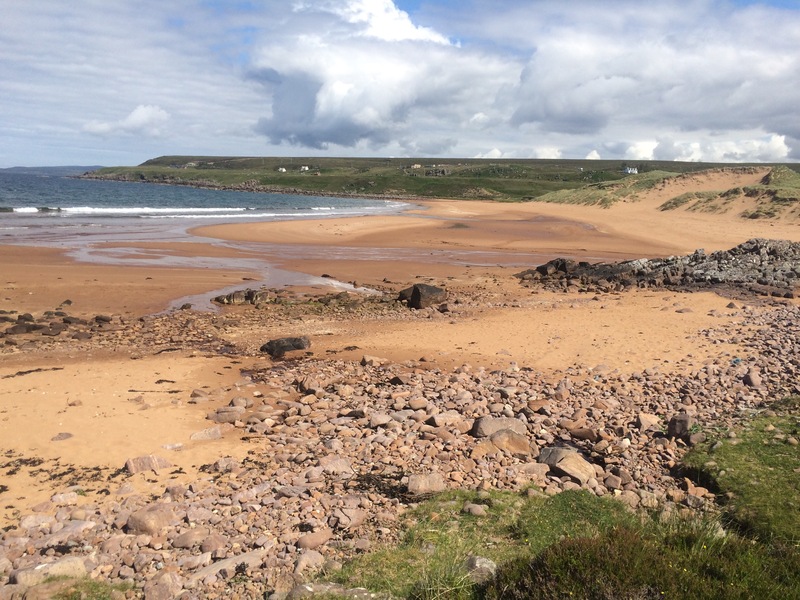 Right on the shore of Loch Gairloch, my 5th sea-facing loch today, it reminded me of Shell Island in North Wales: pitch anywhere, a few dunes, relaxed feel. I found a pitch and went for a walk on the beach. There were kids and kayakers in the sea so I thought I should at least have a paddle. 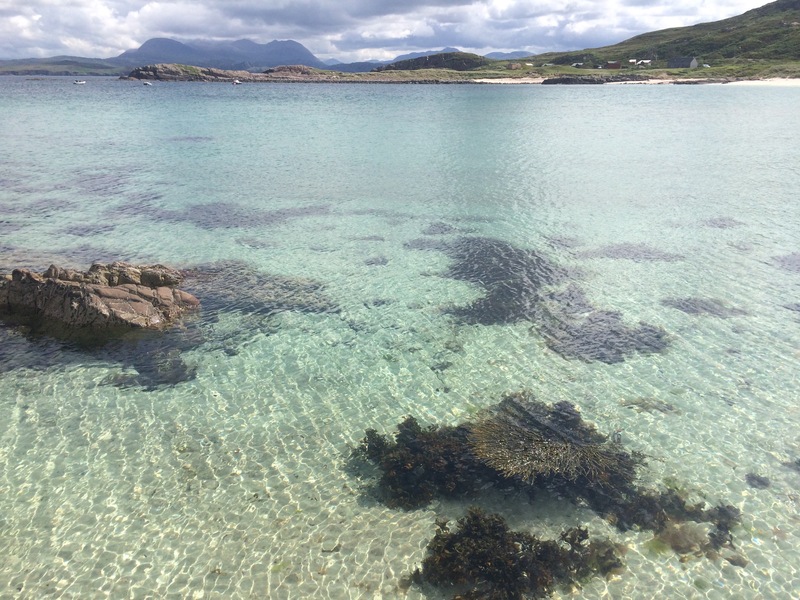 It wasn’t that cold, not as cold as the sea at Mellon Udrigle earlier in the day. I sat in the dunes and admired the view, this was more like a holiday! I couldn’t resist jumping down the dunes (I’m not really 40). The weather today was lovely, according to the car’s temperature gauge it hit 18 degrees, and there was only a light breeze so it felt warmer in the sun. I was down to a t-shirt and had to dig out my sunglasses. I didn’t go as far as breaking out the suncream. Knowing that it was cold and rainy in England was just the icing on the cake as it’s been the other way round for ages. The good weather did mean I got my first proper exposure to midges this evening. I retreated to the car where I could read and listen to the radio in Peace. It was interesting to see how some people retreated inside and others just carried on regardless or sat cocooned in nets. They are definitely attracted to me! It was a bad night. I finally fell asleep sometime after 2.30 am and was awake again just after 5. 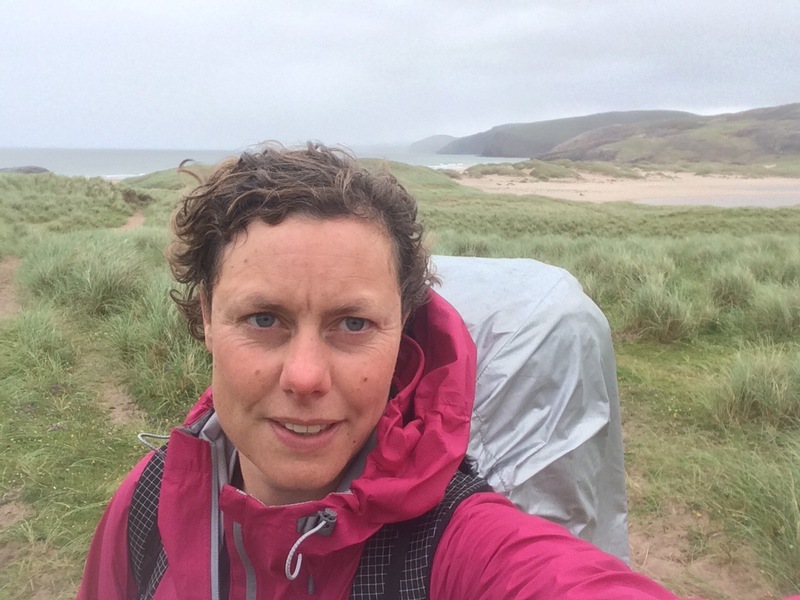 The predicted gale force winds had arrived I think and I couldn’t relax as the wind and heavy rain was battering my flimsy little tent. The heavy rain came in waves and by 5.30 am I couldn’t stand it any longer so packed up. The sky was darker than it usually is during the night! 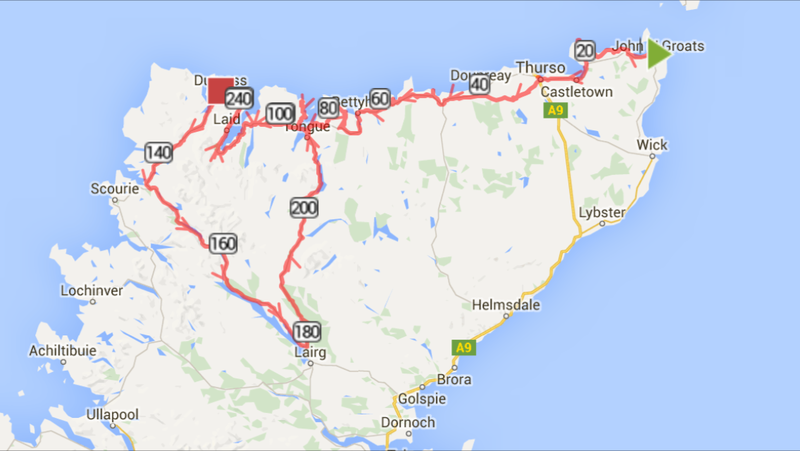 It wasn’t far to Ullapool and I was there by 8 am, even going slowly and stopping a few times. I drove past Stac Polly again, although I couldn’t see it. Look how dark it is at 9 am! 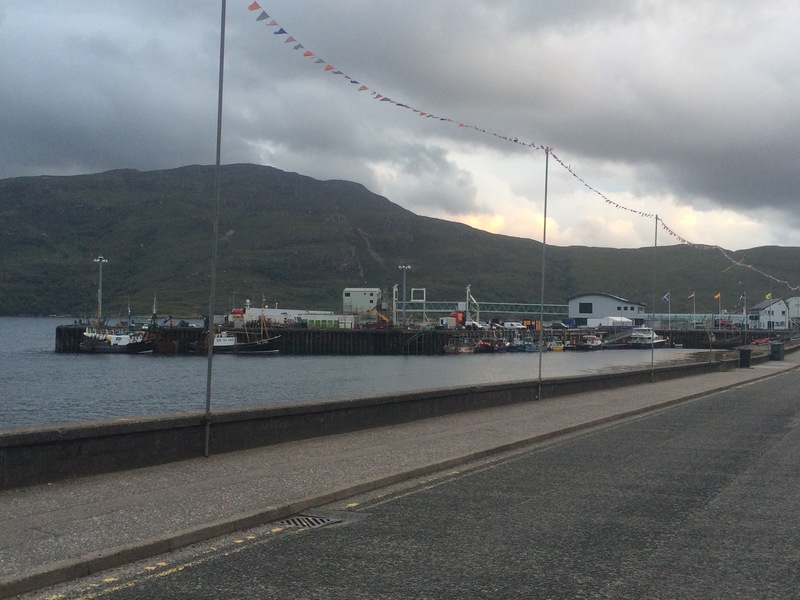 Ullapool is a big town in these parts and the main port to catch a ferry to Stornaway in the Outer Hebrides. 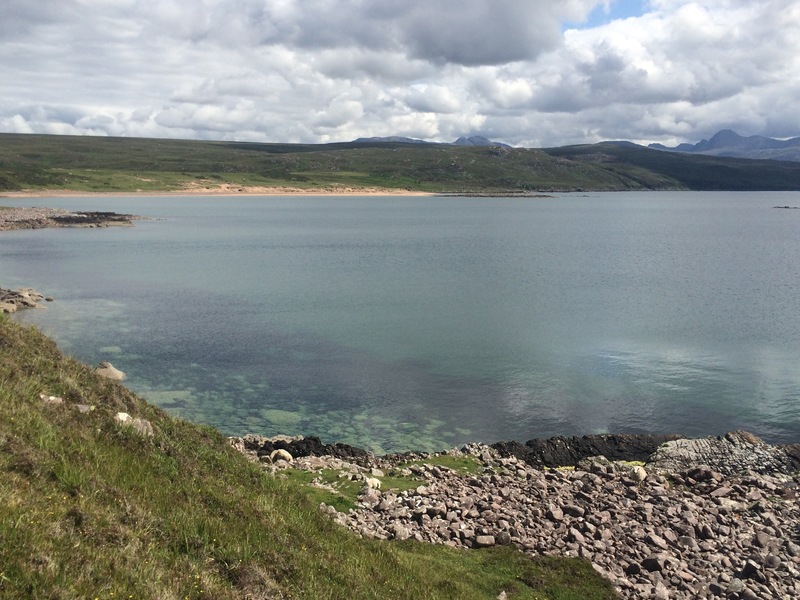 It sits on the edge of Loch Broom. The sky was lightening so I drove out to a small peninsula, parked the car and sat looking at the weather across the Loch for an hour or so. I was tired. The car was being rocked by the violent wind. 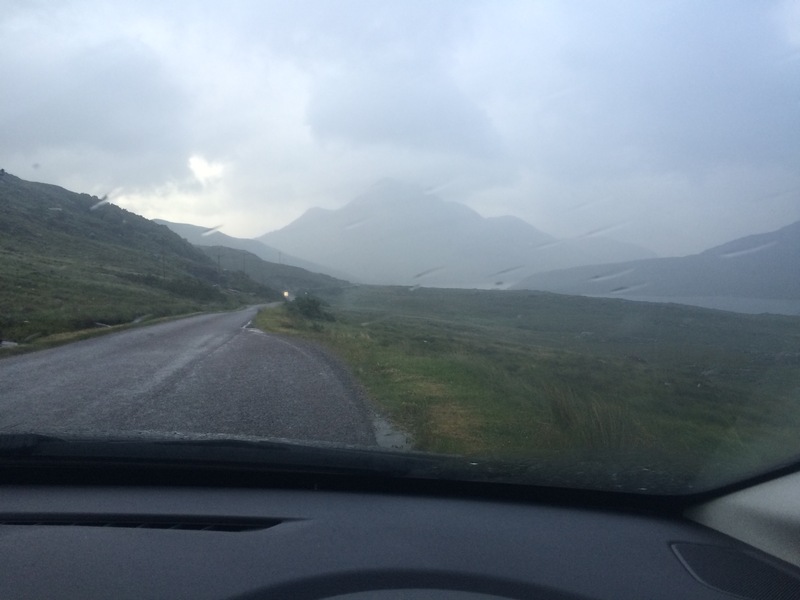 After an hour and a half I drove back into Ullapool. The rain had stopped so I parked the car in a layby, got my tent out and “flew it” like a kite. Within a couple of minutes I had almost taken off twice and the tent was dry. Time for a coffee! I stopped at a small place called Tea by the Sea, with its pink door and craft shop. The people there were very nice and I must have drunk a gallon of tea and eaten the biggest piece of cake ever. All the people in the cafe joined in one big conversation and it was very jolly. 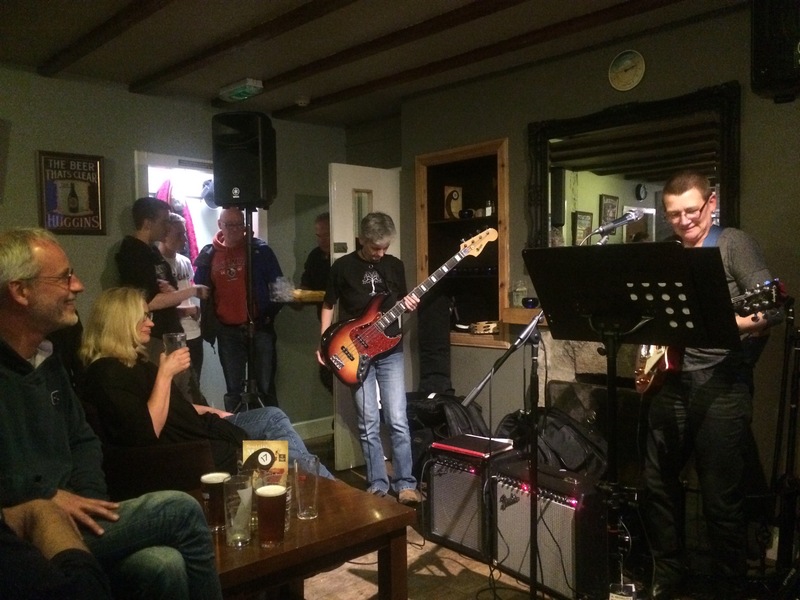 I was recommended to head to the Ferry Boat Inn later for some live music. I took a quick trip to the Ullapool museum and learnt a bit about the Klondikers that came over to Loch Broom for the fishing boom in the 1980s-90s, during the Cold War. The locals really took these Eastern Europeans to their hearts, although the ships must have been an eyesore in the Loch. 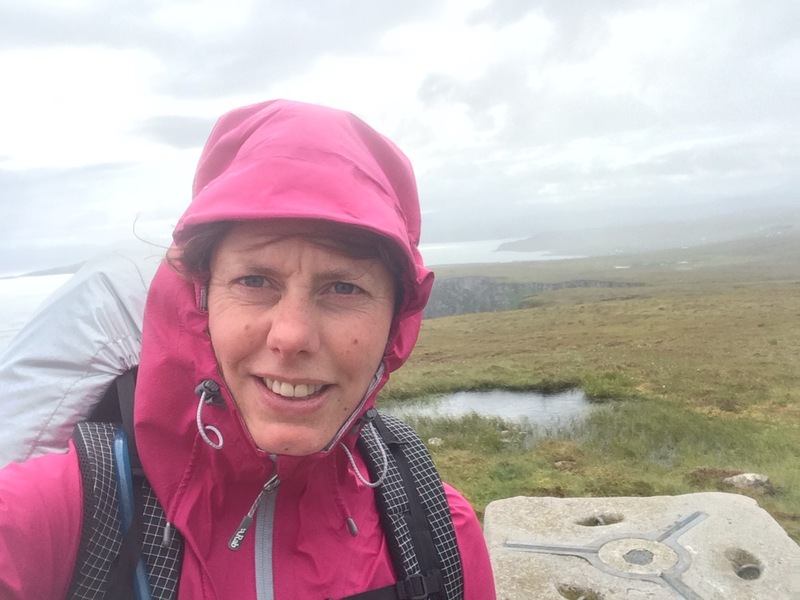 It was raining again and I checked into the Royal Ullapool Hotel. What a treat. My blog must sound quite depressing because my friend Donna had taken great pity on me and bought me a night in a hotel. How lucky am I to have a friend like that? Thanks Donna. I was going to make the most of the luxury, and first off I needed a nap! 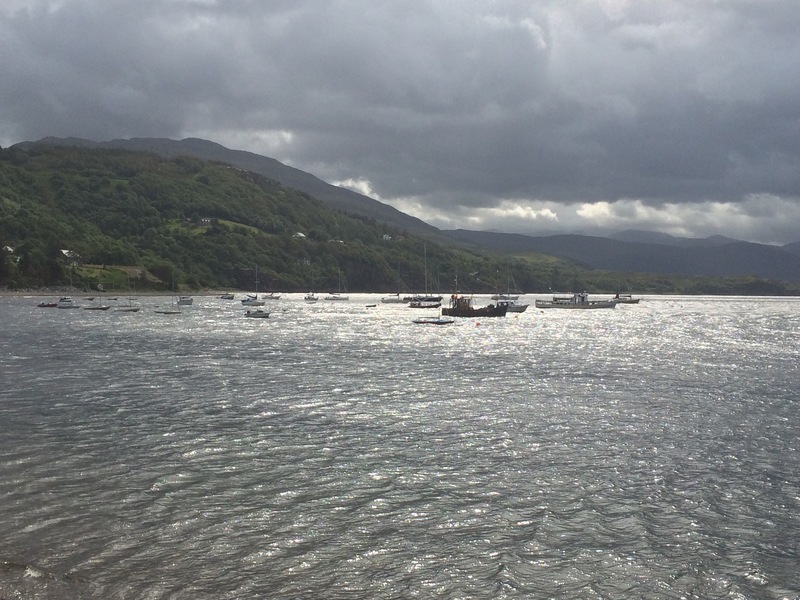 I had a lovely dinner overlooking Loch Broom and then, despite being tired, I headed out to the Ferry Boat Inn to check out the live music. It turned out to be rather good and it was midnight before I crawled into bed. Ah, a nice, soft bed. Zzzz. Apart from Lossiemouth, today was the first time since my very first morning in Scotland that I woke up to sunshine and some blue sky. What a joy it was. I was up at 6 am and away by 7, before anyone else was up. 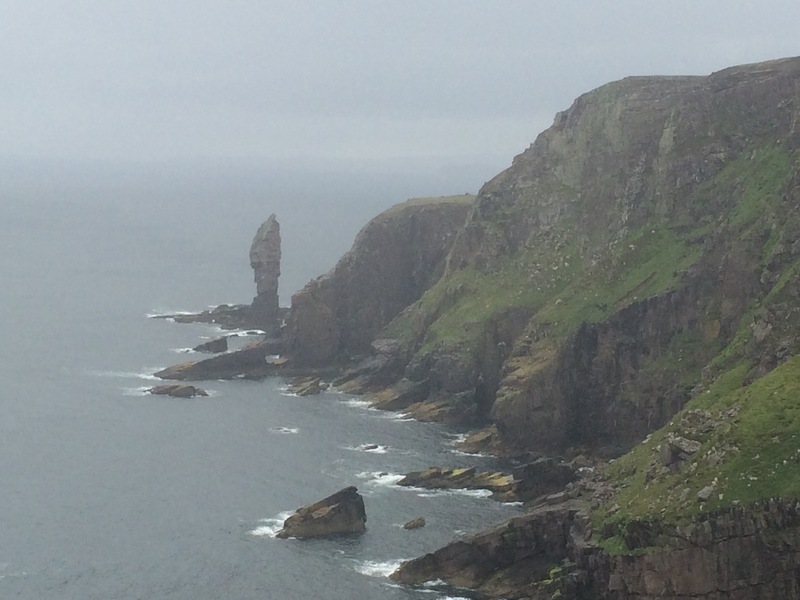 I decided to go back to Stoer Head and walk to the end as there should be great views. I started walking at 7.30 and within 15 minutes my waterproof was on and it was raining. Gutted. I did get some views as the rain was on and off, but not as good as it might have been. The path was very boggy and required a lot of nimble footwork to avoid getting very wet feet. 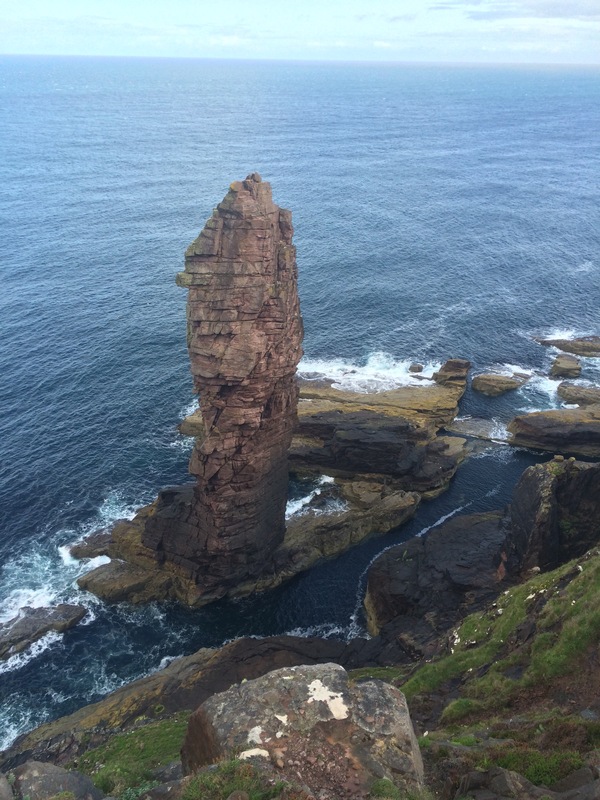 It didn’t take long to get to the Old Man of Stoer, and it looked magnificent, I reckon people must come to climb this stack. On the way back the rain started getting heavier and so by the time I was back at the car I was soaked. (I have discovered my waterproof jacket no longer seems to be waterproof, which is a bit of a pain in this weather.) I could see blue sky further inland but the clouds were moving fast and heavy showers were to be the order of the day. Heating on full blast I drove to Lochinver looking for coffee. The first thing I found was the Highland Stoneware Pottery Company. 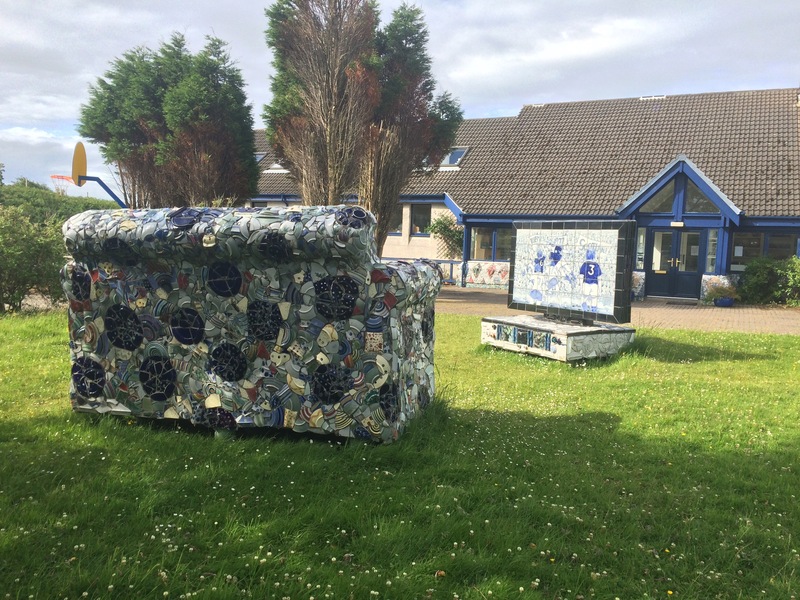 They have a workshop in Lochinver (and Ullapool) and it have decorated it with broken pottery that looks amazing. I found the Lochinver Larder, which serves good coffee (my first one in weeks) and pies. They have a mail order pie business. I ordered a latte and a pear, chocolate and almond pie. It was very nice and I was sorely tempted to buy a savoury pie for later, except that I was intending to go to a nice restaurant for dinner. The rain showers kept coming so I had a cappuccino as well. Totally wired on coffee I set off when the sun reappeared, along the coast overlooking Enard Bay on one side and several mountains and lochs on the other. 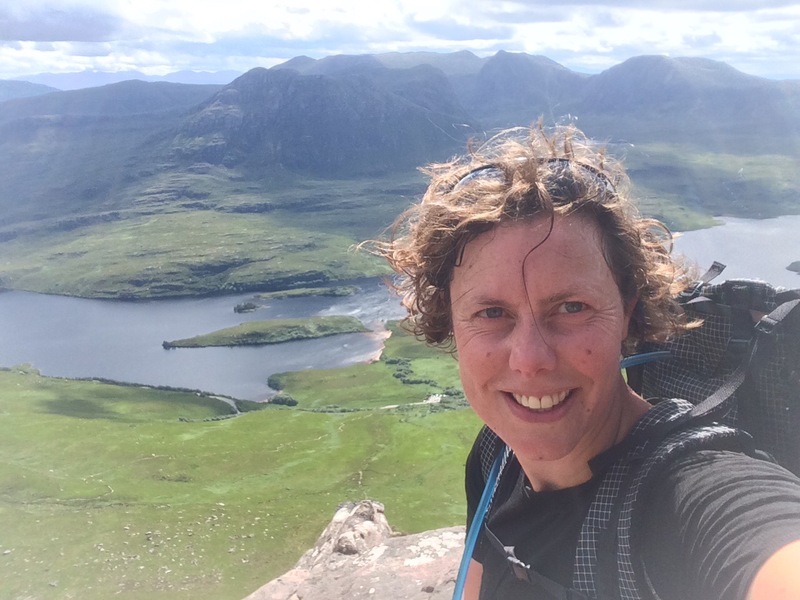 I took the Ullapool road and headed for Stac Pollaidh, a small mountain (612m) that had been recommended by Dave for its good views. Another nice drive to enjoy and this time I could see a lot more as the clouds were much higher. Crossing the River Kircaig took me out of Sutherland and back into Ross and Cromarty. People who can’t reverse a vehicle should not drive these roads. I caught up with a small fuel tanker (a small one only just fitted on the road and around the bends) and got stuck in a traffic jam. All vehicles that we came across heading towards us had to reverse to suitable passing spaces as there was no way the tanker was reversing. Well we found a driver that couldn’t manage that! I think in the end someone else reversed the car. These roads are fun to drive. The Stac Polly car park was full so I knew I wasn’t going to be alone. 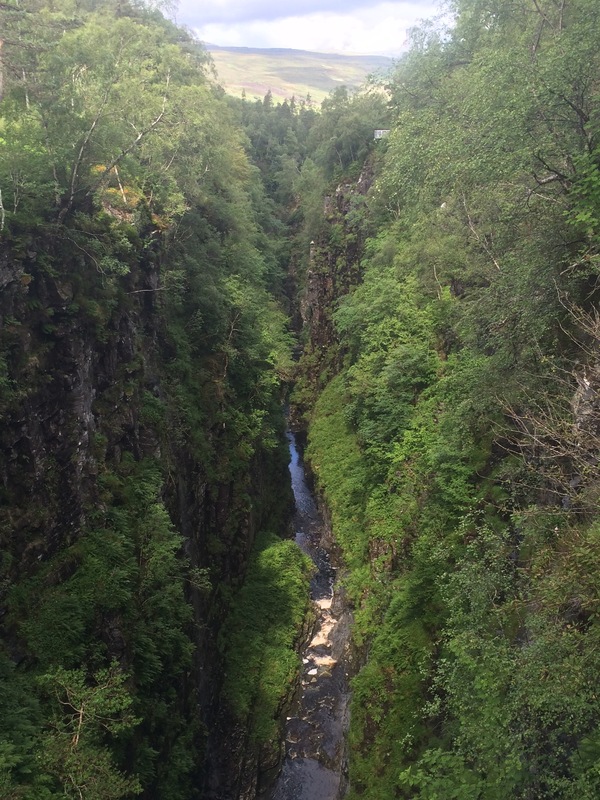 I enjoyed the steep walk up and the views were indeed stunning. 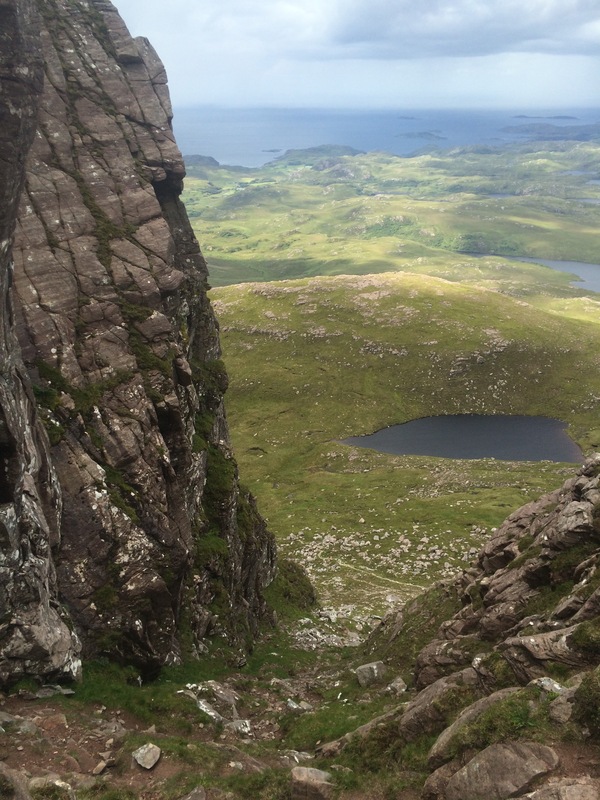 It only took me 40 minutes to zoom up the well-trod path and I carried on scrambling up the rocky peak to the summit. I made it along the very top until the last stack, which I decided would be foolhardy for me to attempt as it required a bit of rock climbing in a gale. Instead I thought it would be more sensible to scramble/climb down a steep, watery gully. Thankfully I made it in one piece, although I’m not sure about the German couple who were following me! I’ve been checking the news for missing person reports all evening. The weather is definitely not on my side. Five minutes before I reached the car the heavens opened and I got another soaking. Car heating on full again. The car temperature gauge reached a new high today: it actually went up to 14 degrees, not for long, but it did get up there. 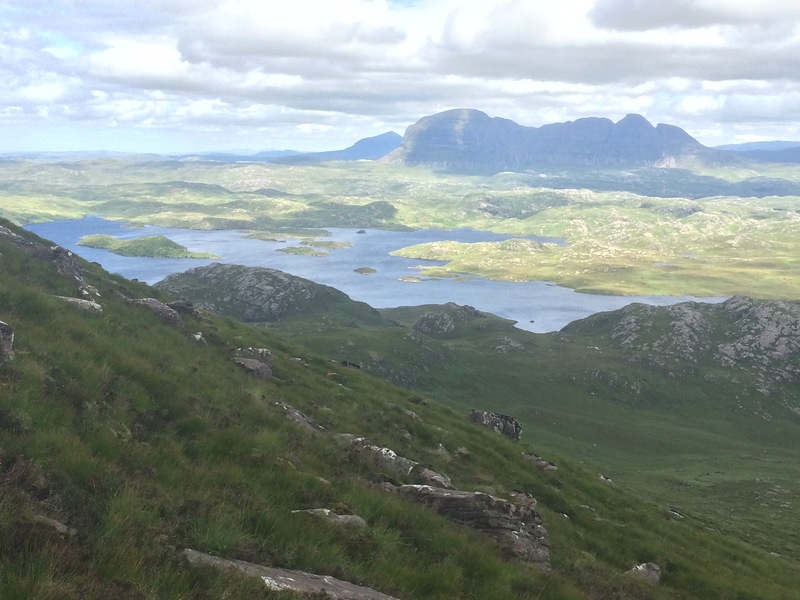 I headed up and over the Rubha Mor and suddenly there were the Summer Isles spread out before me. Wow. The sunshine was coming and going so I had a pretty good view. This is clearly a touristy area and there are plenty of places offering accommodation. 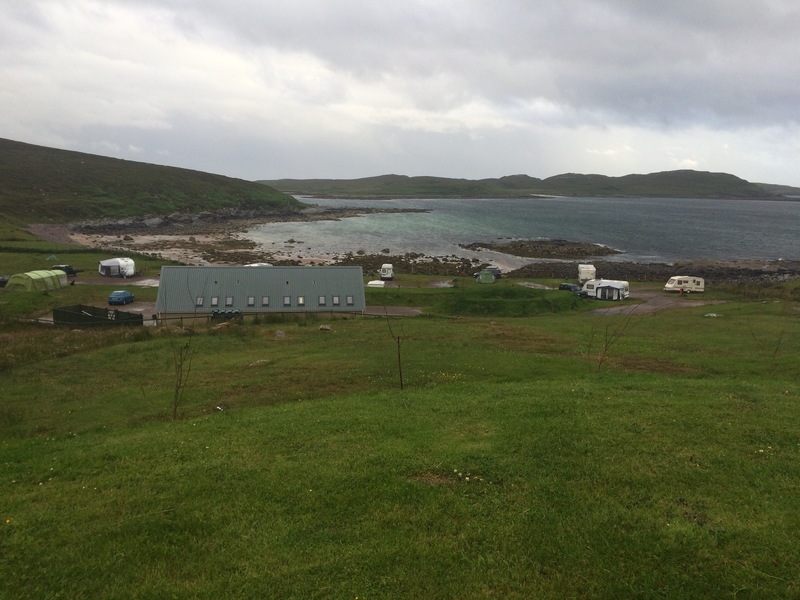 I stopped at the campsite in Althandu, although I was slightly concerned by how exposed it looks considering the high winds forecast to accompany the rain tonight. Oh well, hopefully I’ll survive! The site has good facilities, including a washing machine, so I took the opportunity to use it. The campsite owns the Fuaran Bar opposite, which did not serve good beer and was full. 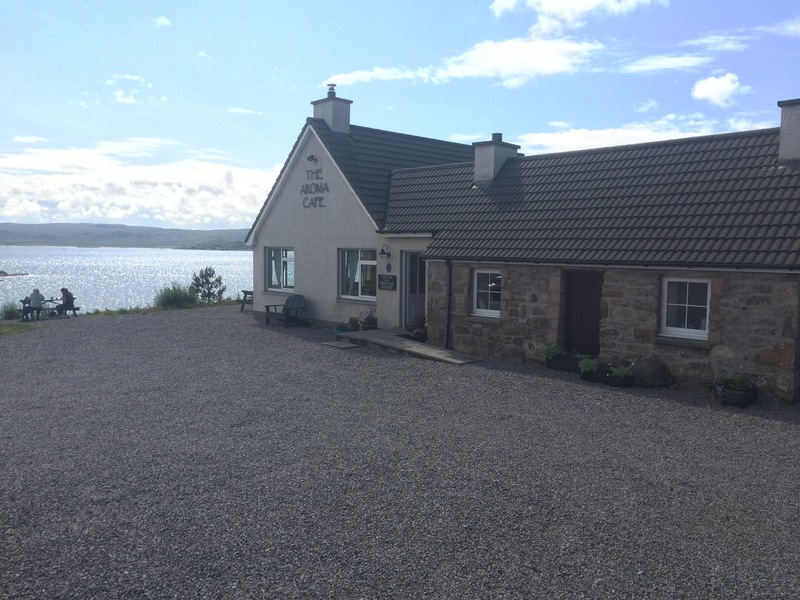 I drove down the road to Achiltibue for dinner at the Summer Isles Hotel, as recommended by Donna. The restaurants here are not cheap but the seafood is fresh and delicious. I did not go for the seafood platter as I’m not a fan of oysters and rollmops, but the mackerel pate and fish pie were delicious, as was the real ale. Unlike at home where the decent pubs serve beer and lager is frowned upon, up here the locals drink Tenants lager and the barmaid told me they take the beer off tap in Winter as it’s only drunk by the tourists. I woke up when the heavy rain started at about 5 am. Then the wind picked up again. The sky looked very dark grey with no sign of a break. I snuggled down thinking I might just give up and lie there until the weather improved (next year?) but after a while the wind became so strong that I thought the tent was going to break. Every so often a huge gust would slap the wet tent against my face as if to wake me up and eventually the rain was coming in. When my sleeping bag started to get wet I had to get up. I packed away, chucked the wet tent in the top of my bag and started the 4.5 mile trek back to the car. In the end I didn’t even walk along the length of Sandwood Beach. Not sure about this wild camping, maybe in sunshine with friends. There was at least a toilet in the car park so I managed to have a quick wash and clean my teeth, but my hair was a lost cause. I got soaked through on the walk back so had to sit in wet shorts in the car with the heater on full blast listening to the weather forecaster on the radio saying Scotland would have a dry day. What did he know! 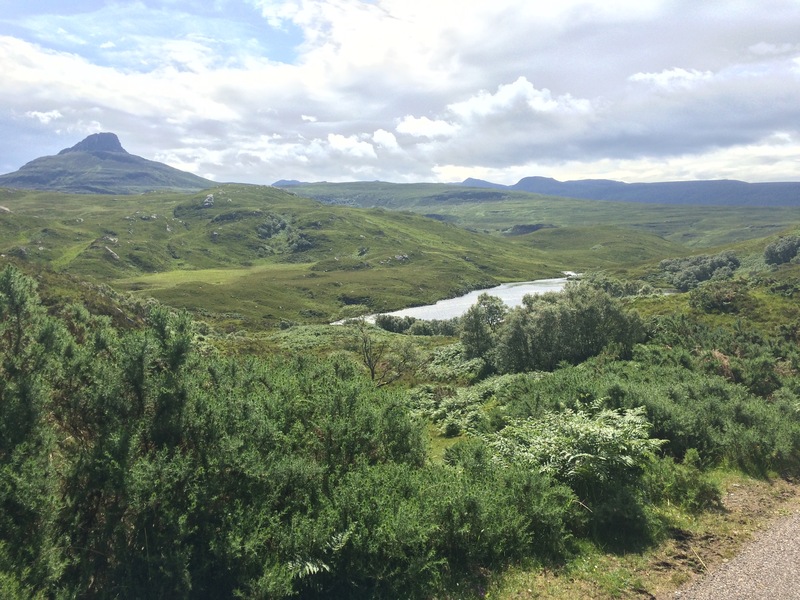 I drove out of the car park and back along the Kinlochbervie road. The Old School restaurant in Kinlochbervie had a sign saying it was open so I went in to see if I could get a hot drink and some breakfast. The people in there had all been staying at the B&B but the waitress didn’t seem to mind catering for one more and I had my first big breakfast in ages. I was glad of it. It also gave me a chance to dampen another seat other than the one in my car! Feeling a little drier, fuller and warmer my feelings of driving all the way home changed to looking forward to seeing a bit more of this West Coast because, so far, the North Coast is winning it for me. Despite the persistent rain until 3 pm and the awful visibility until the evening, I was in for a treat. Wow wow wow. How can somewhere be so beautiful in such awful weather? (Unfortunately the photos do not do it justice because of the bad weather.) I would describe the West coast as lumpy, rocky and watery. 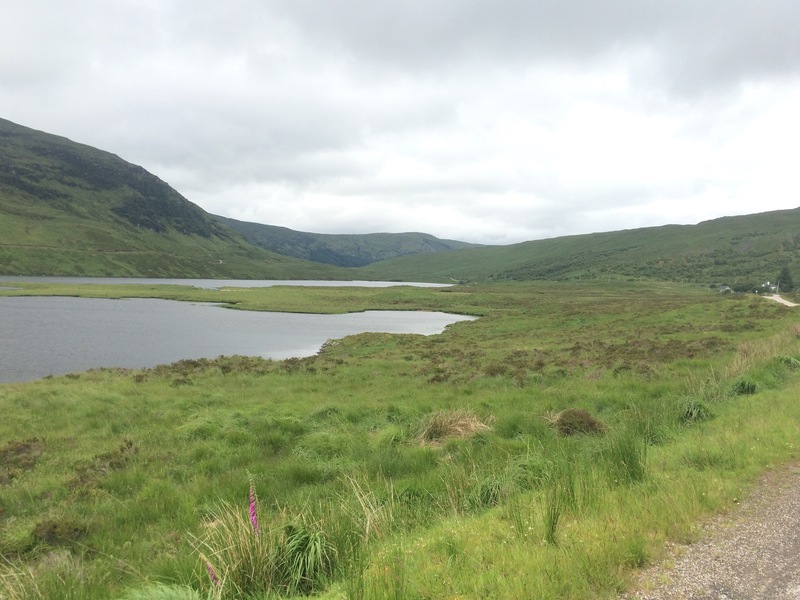 There are so many lochs! I always think of lochs as being at sea level but many of these are higher up, some with streams flowing from one to the next) and remind me of Lake District tarns. I wonder if anyone has swum in them all? It was really fun to drive some of the roads; so narrow, twisty, turny, up and down, up and down. I have never driven so much in first gear! It would be fantastic to cycle these short, steep hills. 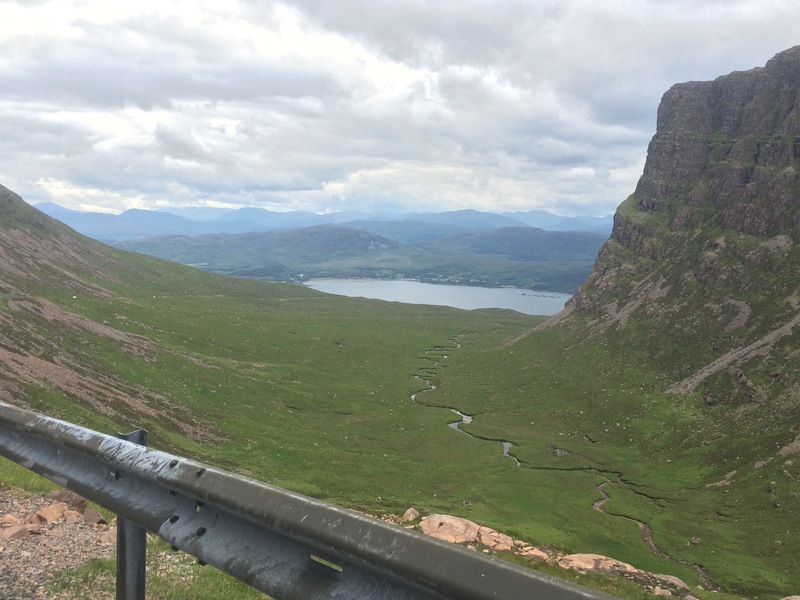 My favourite driving road was the Foindle, Fanagmore, Tarbet loop. I stopped at The Shorehouse in Tarbet for a coffee. Having eaten a huge breakfast I unfortunately didn’t need to eat anything from their Rick Stein-recommended seafood menu. This restaurant catches its own just off-shore. 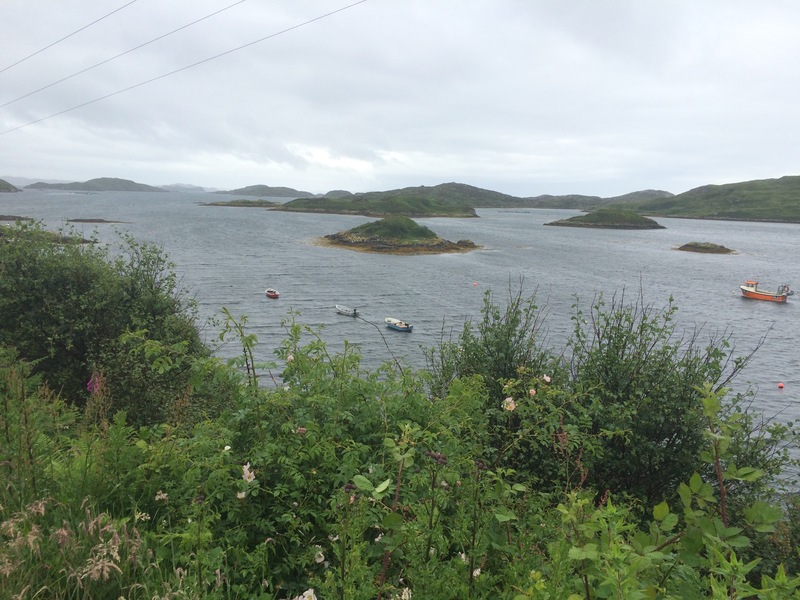 Ordinarily one can catch a ferry from Tarbet to Handa Island just across the Sound of Handa. Unsurprisingly today’s ferries were cancelled due to bad weather. The sea looked rough. Oh the views. Despite not being able to pick out the back drop of mountains (or sometimes even the middle ground) through the mist and rain, there were still breathtaking moments, mainly as I rounded yet another bend and overlooked a fantastic loch with lots of islands. 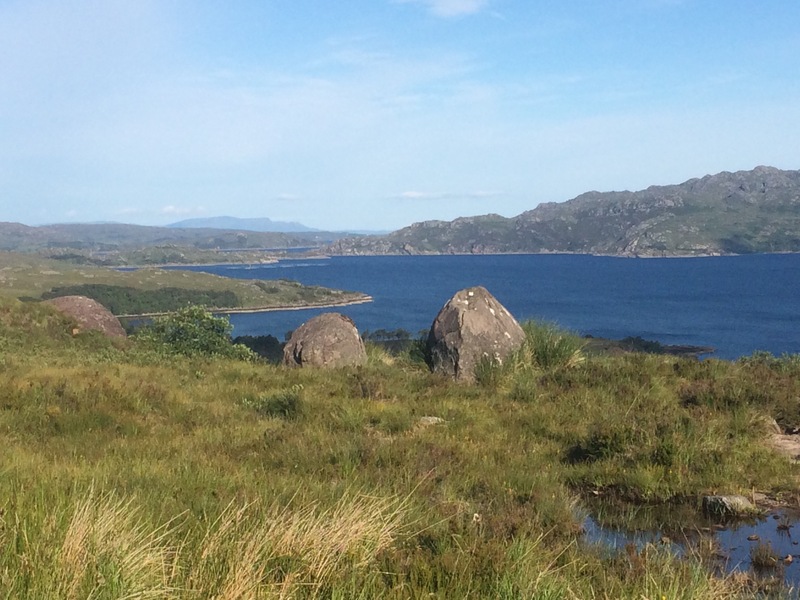 Three big lochs (a’ Chairn Bhain, Gleann Dubh and Glencoul) all meet at Kylesku. I didn’t get a good view on the approach but there was a picture on a notice board so I could see what I was missing. 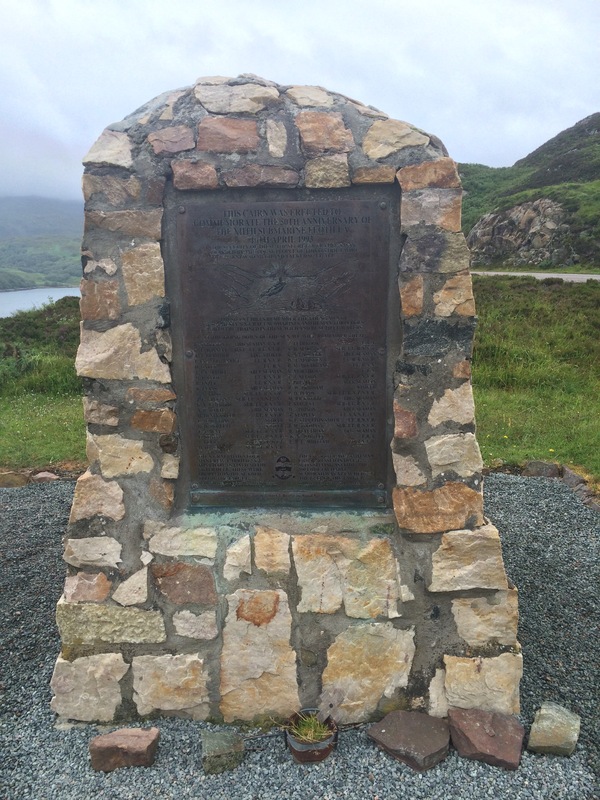 There was also a commemorative cairn dedicated to the XIIth Submarine Flotilla whose top secret x-craft submarines and human torpedoes trained in these deep lochs. 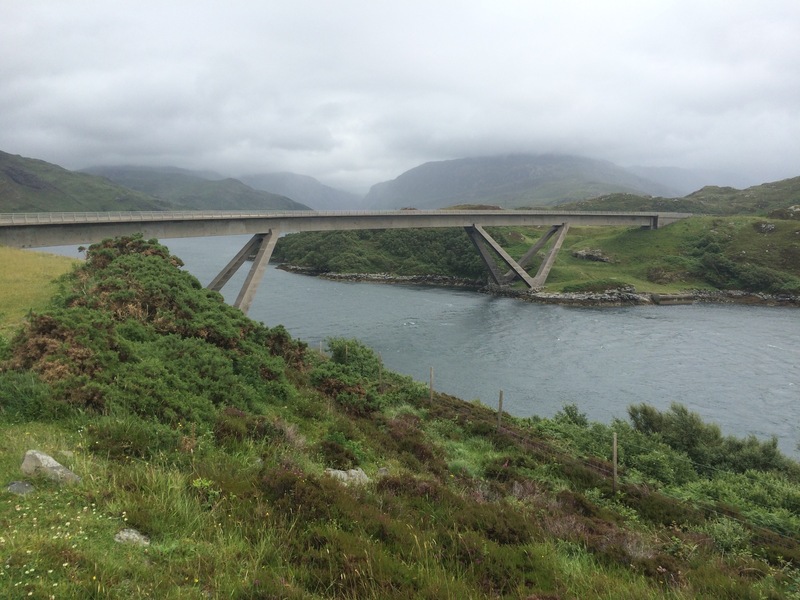 The bridge over to Kylesku was built in 1984. Before that there was a daylight ferry or else a 110 mile trip by road! 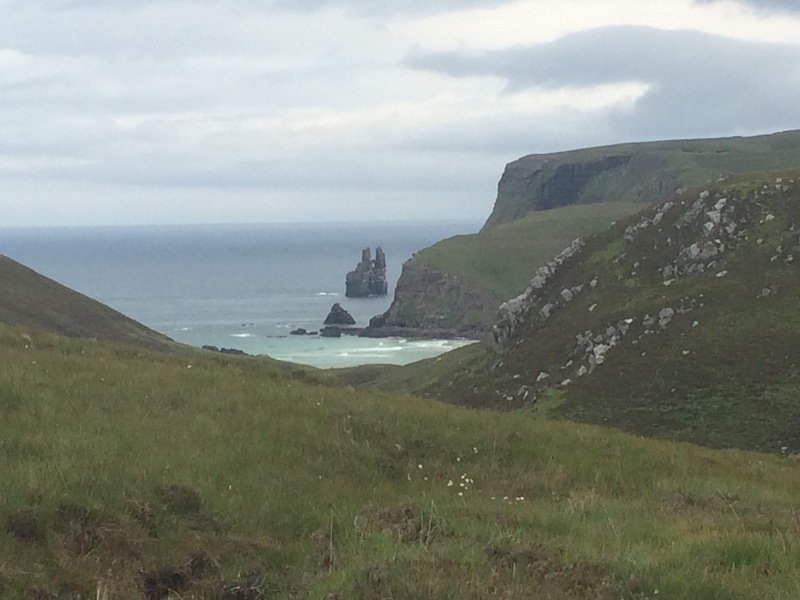 I was now in Assynt and took the coastal detour via Drumbeg and Stoer. The views across Eddrachillis Bay were out of this world. The Eddrachillis coastal parish is made up of 35 islands. 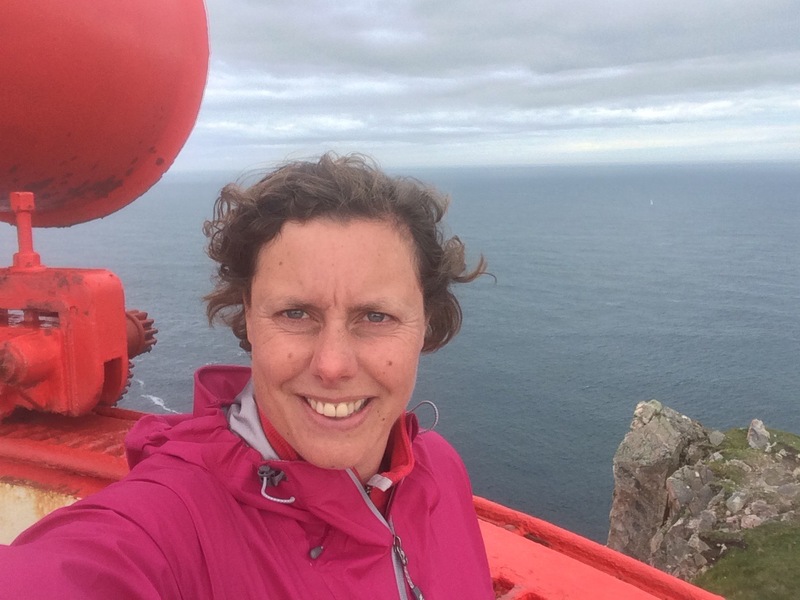 I drove up to the Stoer Lighthouse and I wanted to walk to the Point of Stoer but it was 4 pm and I had nowhere to stay yet and a wet tent. Maybe tomorrow. I got to the campsite just before 7 and the bad weather had cleared up; the all-pervasive grey cloud had lifted somewhat. My tent was up by 7 and drying. I got my shower and then walked across the lovely little beach to the split rock and sat there looking at the view. I could see some mountains. 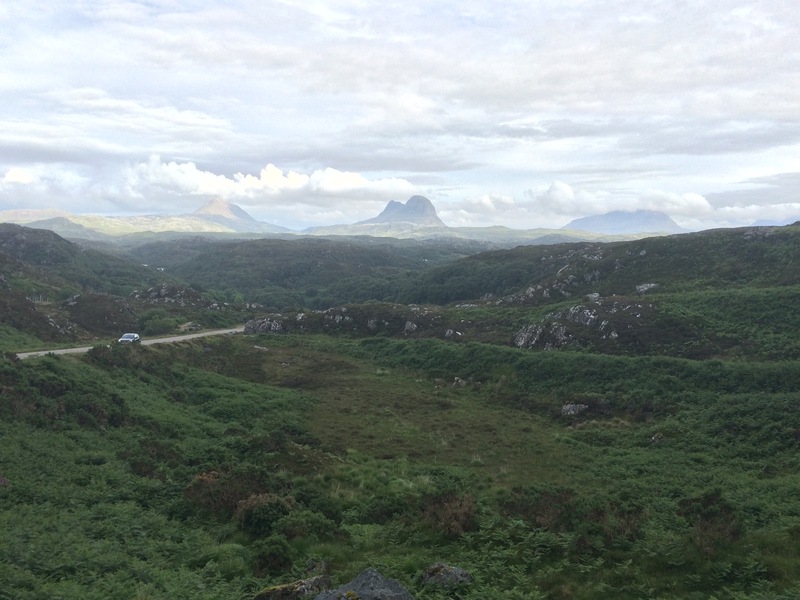 The best looking one was Suilven, with its steep sides. 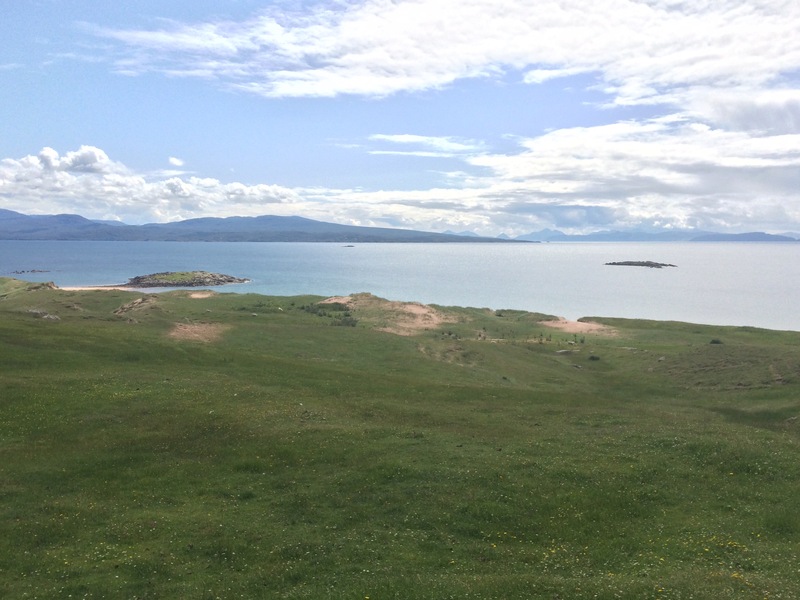 I could see Skye…and the Outer Hebrides. At last some proper views. 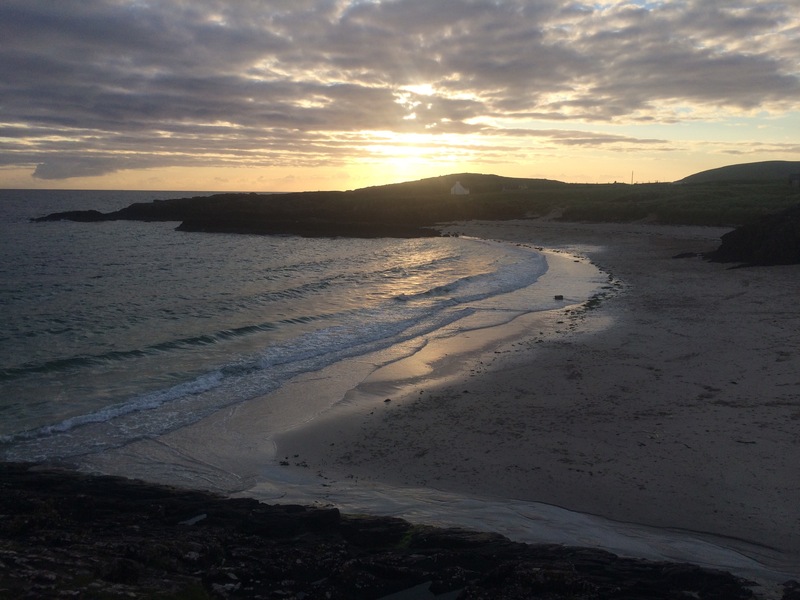 We even had a sunset…my first since Cullen in Morayshire! It wasn’t raining this morning so packing away was pretty straightforward. 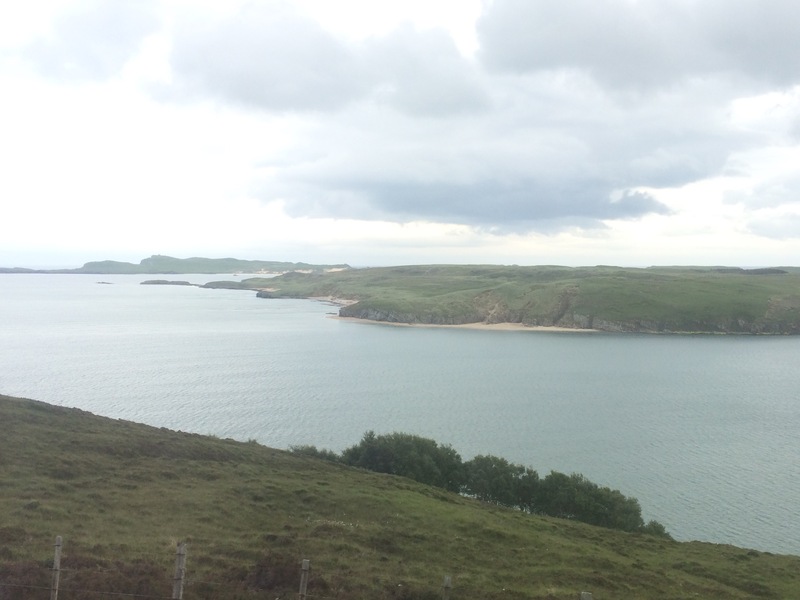 I popped into the local shop for some bread to make a couple of cheese sandwiches and then I drove down to Keoldale to get the passenger ferry across the Kyle of Durness. 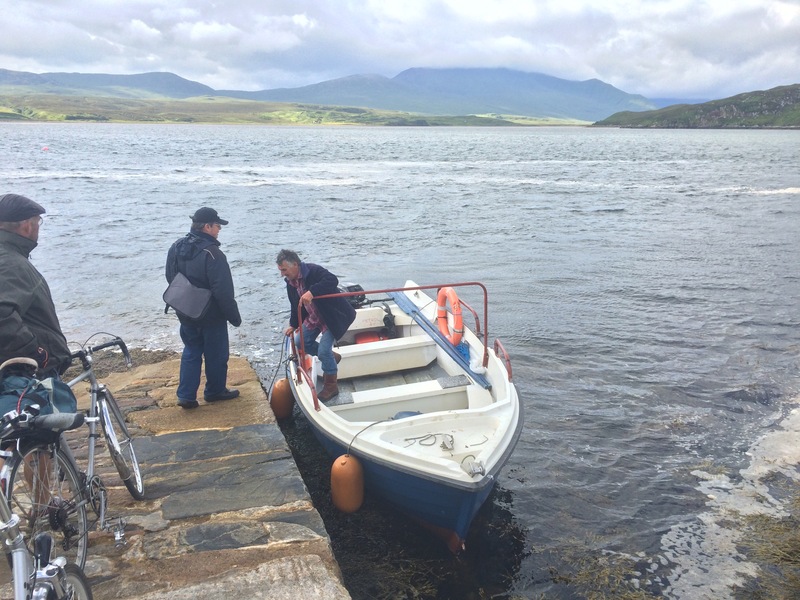 The ferry is weather dependent and the ferryman stopped a couple taking bicycles as he said the wind was going to pick up to nearly gale force later and so we would be his last passengers (except for collecting us at lunchtime). 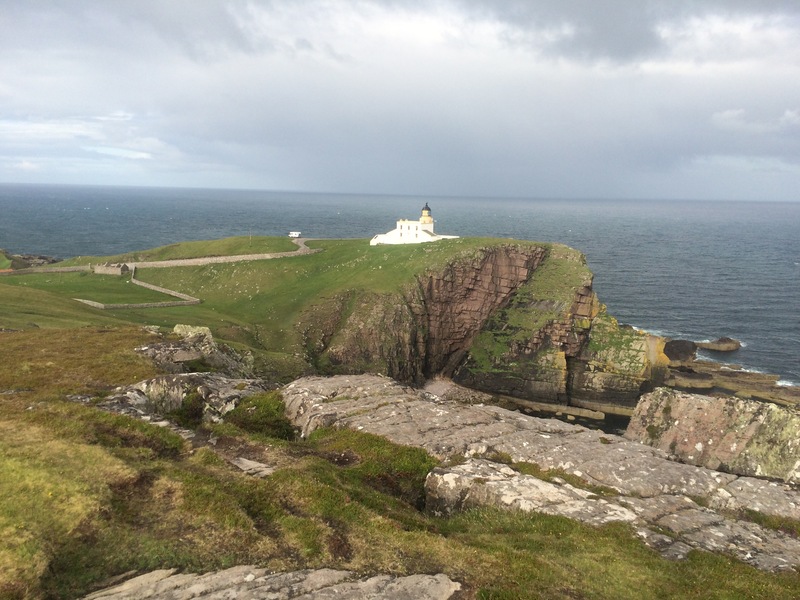 It is possible to walk around Cape Wrath, but it’s a peat bog and there’s a minibus that drives the 11 mile road to the lighthouse. When I say road, it used to be a road but now, courtesy of terrible storms in 2013, it’s a series of potholes with a bit of Tarmac in between. Our minibus driver, Reg, was full of information, even though he was from Yorkshire and just doing a retirement summer job. 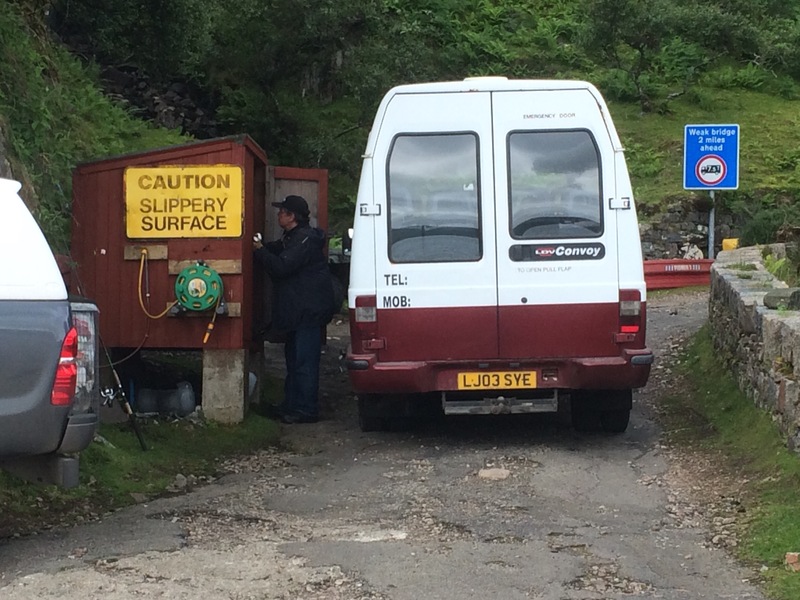 It took over an hour for the minibus to negotiate the 11 miles. 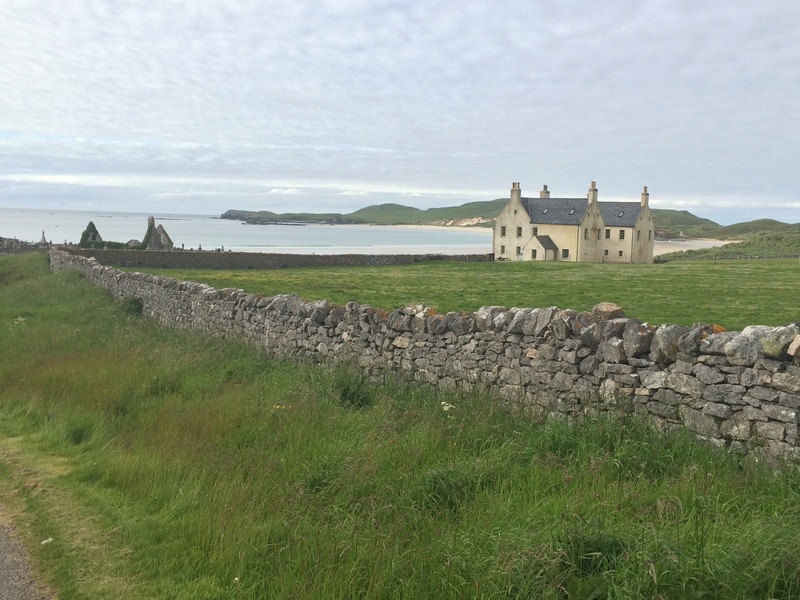 There are 2 houses on Cape Wrath, both owned by top surgeons as holiday homes. The lighthouse is also permanently inhabited by John and his dogs. 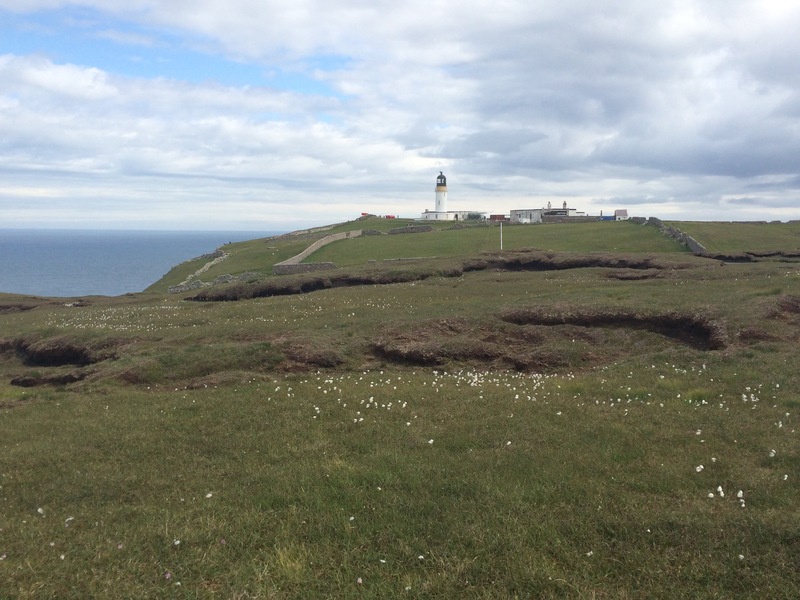 The only way to Cape wrath (without walking across the peat bog) is by boat to access the road that was built by the Northern Lighthouse Board. It was very windy and cold on the edge, but I have made it to the far North West of the UK mainland. I could just about see the Outer Hebrides through the gloom, and I could also see Sandwood Bay a few miles down the West coast. 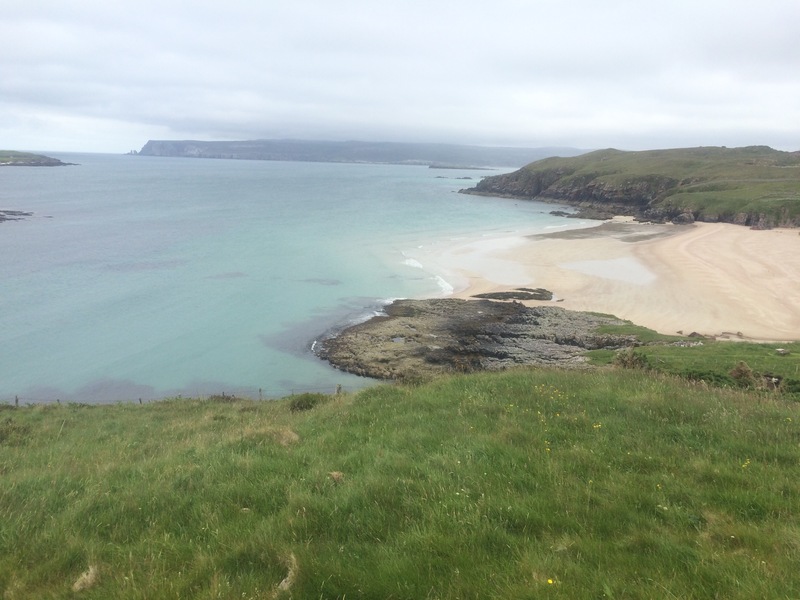 At one point we did also get a goodview of Kearvaig Beach just East of the point and at a break in the highest cliffs in the UK. The boat trip back across Kyle of Durness was a wet one as the strengthening wind caused whipped the sea into the boat. I was sat in the firing line! I was soaked when I got in the car so heater went on full blast to dry me out. 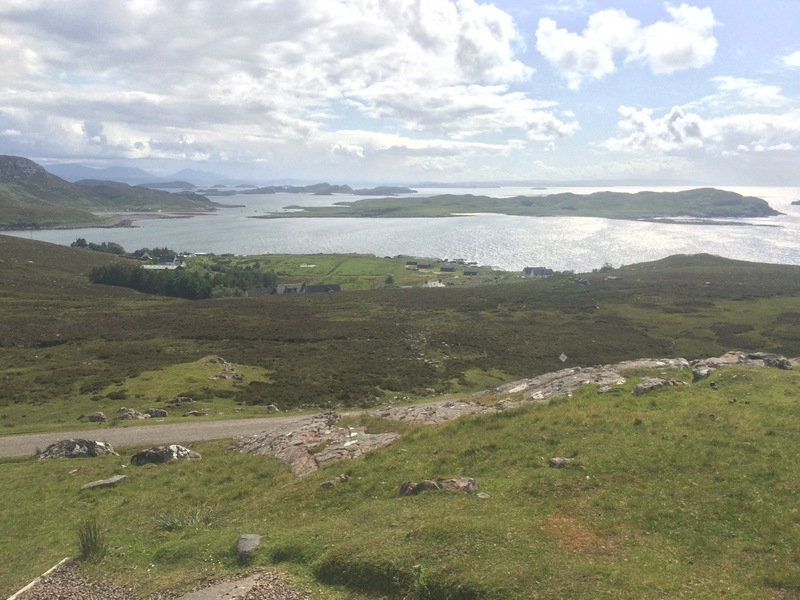 I drove down the road to Kinlochbervie. The landscape has suddenly changed as I’ve moved from the North coast to the West coast; it’s definitely rockier. Rocky landscape; like a prehistoric world! 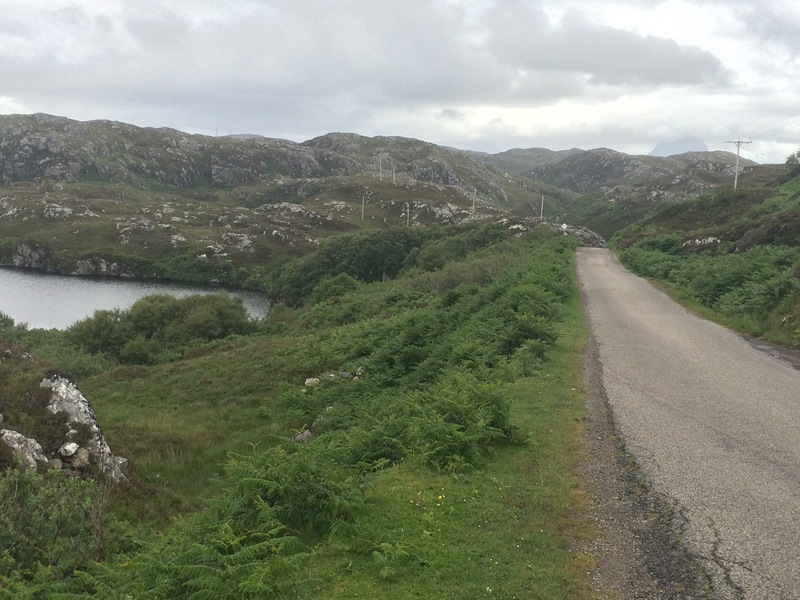 The short road to Kinlochbervie heads up the side of Loch Inchard and passes 10 small settlements (Kinlochbervie being the largest). Despite the all-pervading greyness this was a picturesque road. 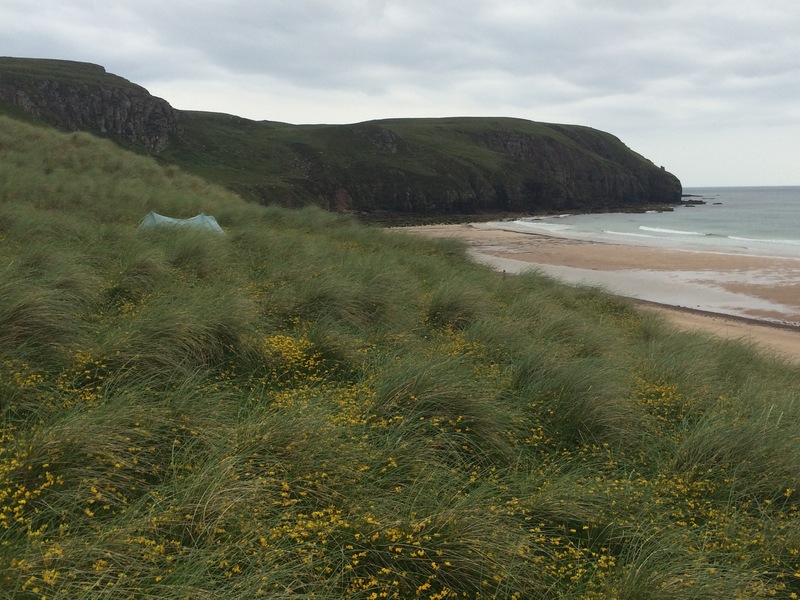 I had decided that it was time I wild camped, and what better place to do it than the renowned Sandwood Bay. Despite being windy and a bit chilly I parked the car in the (full) car park and packed some food in my rucksack. 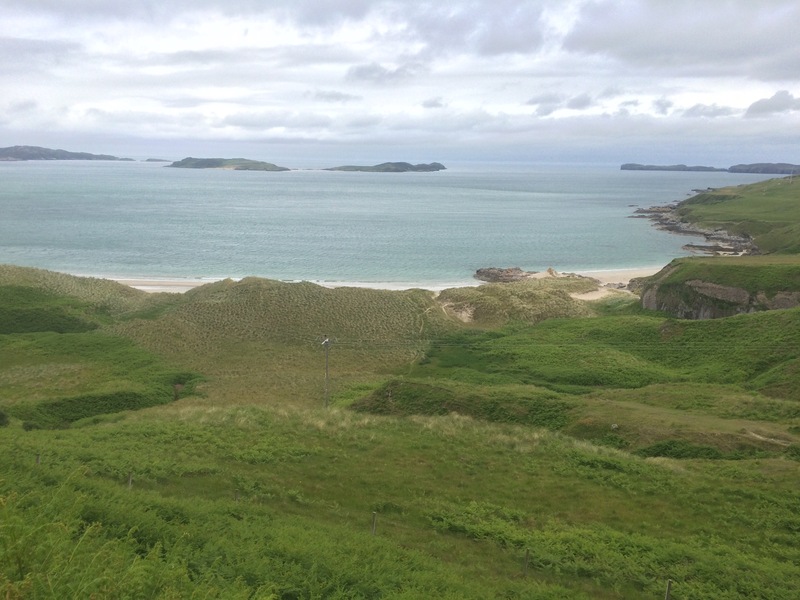 Sandwood Bay is a 4.5 mile walk from the car park, thus making it possibly the most remote, yet easily accessible, beach in the UK. 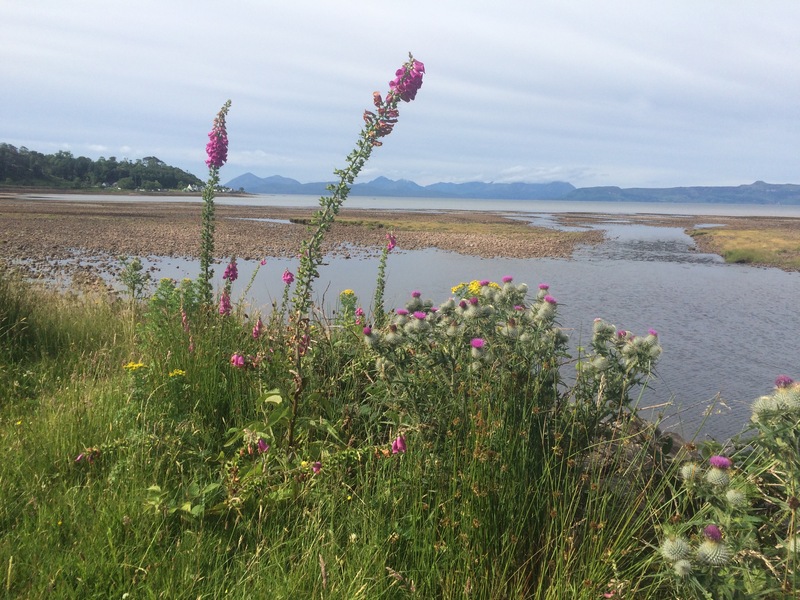 The John Muir Trust maintains a good footpath across the boggy hinterland so it’s not a difficult walk. I saw a lot of people (and sheep) on the track; the sensible ones were heading back to the car park as it was starting to rain. I did think about turning around but decided to tough it out. Coming over the last rise the view of the beach and Sandwood Loch behind it was lovely. 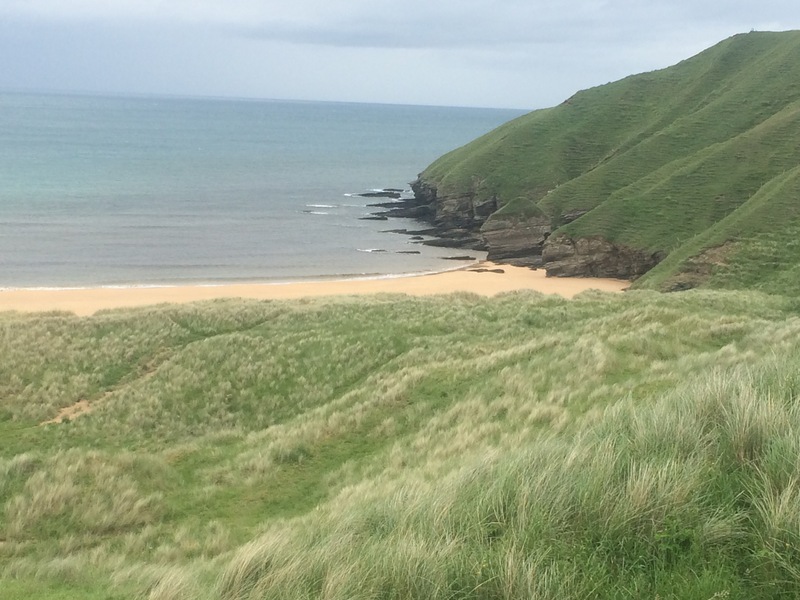 The sand dunes are tall and steep, great for jumping off! I walked around to find somewhere to camp and decided on a spot overlooking the sea with a bit of shelter from the almost-gale force wind. The next rain squall hit so I quickly put the tent up and got inside. 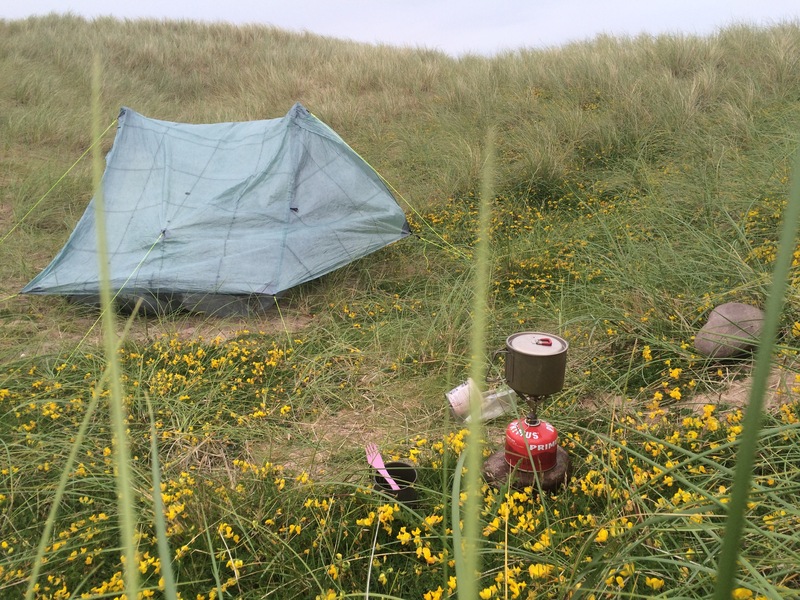 As soon as the rain abated I took the tent down and moved further into the dunes as I was concerned the wind was going to tear the tent apart. I pitched for a 2nd time, this time in the biggest dip I could find. 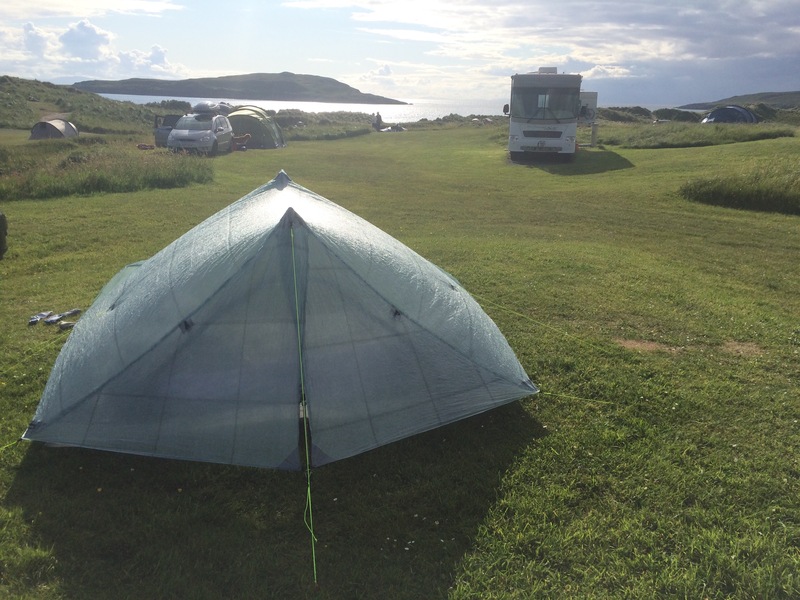 I now had no views of the sea and my tent was still being buffeted like mad. It was 5.30 pm and I briefly considered (again) packing up and heading back. But no, I was going to stick it out and wild camp if it killed me! I think wild camping takes some practice to develop the skills of: excellent kit organisation (this is crucial), cooking something vaguely decent with one pot for everything, cleaning pots and oneself with no facilities, managing water. I do not possess these skills and struggled a bit. Dinner was terrible – pasta parcels and a tomato sauce. Note to self – tomato sauce is particularly messy and should be avoided next time. It was spitting again and I had cooked, eaten and cleaned up (sort of) in about 15 mins. It was blowing a gale, raining and any romantic thoughts of sitting on the beach watching the sunset (with a BBQ, a fire and a glass of wine) were so far from reality. I was in bed by 6.30 pm, trying to read while listening to the howling wind ripping at my tent. No chance of hearing the sea above that racket! There was a short break in the wind and rain at 9.30 so I got up for a last pee. You wouldn’t believe how quickly the midges come out! The problem of being in a sheltered(!) spot I suppose. Fortunately I managed to get back in the tent before I was harassed too much. What an evening! Eventually I must have fallen asleep sometime after 10.30 pm. At least sand makes a comfortable bed. This week my walking trip almost became a full on bus trip and then did become a driving tour. This was not in the original plan but is an adaptation based on the persistent poor weather. With no coastal path I have all but given up on off-road walking as it is quite difficult without being constantly soaked. 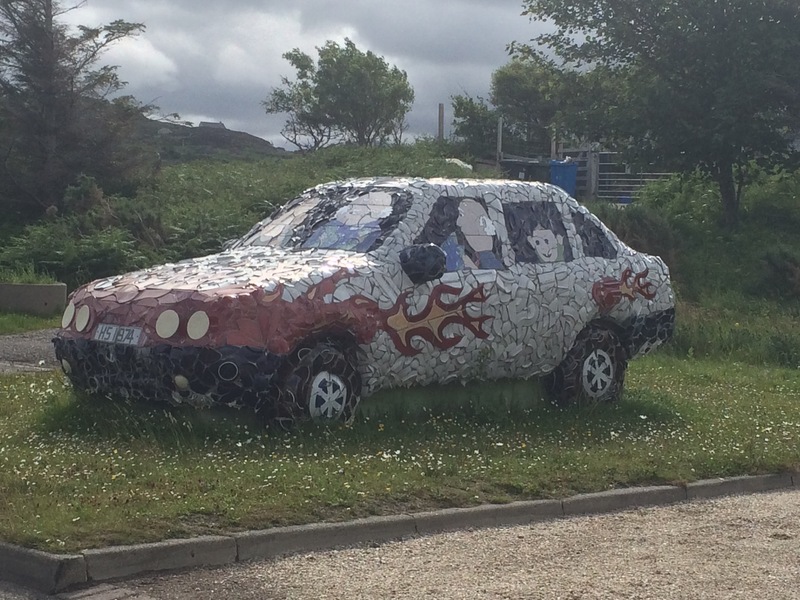 The trip definitely became a chore this week and so I decided to take my own advice on the best way to see North Scotland and hire a car. The only sun I have seen this week was on the Lossiemouth coastline and I am very grateful to Dave and Cally for putting me up for a second time. I have found my enthusiasm for this trip being depressed by the knowledge that back home there is an above average summer, while up here it is the worst on record. I have thought about going home a lot this week. The last few days I have been quite cold (today’s temperature barely reached 12 degrees, not including wind chill) and am wearing 4 layers of clothes. I am sticking it out for the moment as I really want to see this part of the country. I am a little sad that I’m not seeing it at its best. Fingers crossed for better weather even though it’s not forecast. 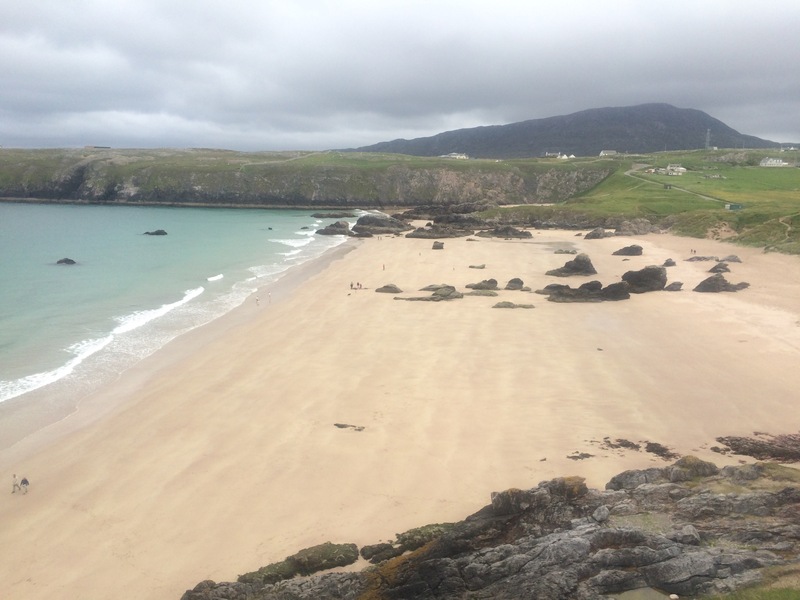 On the plus side, I have seen the most amazing beaches on the North coast. I don’t believe the beaches can get any better than this, if only the weather was good (or I had the means to dry things properly) I’d be straight in the sea. It rained through the night and was raining when I woke up. I had planned to take a trip to Cape Wrath today but there was no point as the visibility was dreadful. Some cycle tourists were packing up in the rain and were soaked. I was glad I had a car. I sat in the car for an hour and a half, reading and listening to music, hoping the weather might clear a bit. It didn’t. 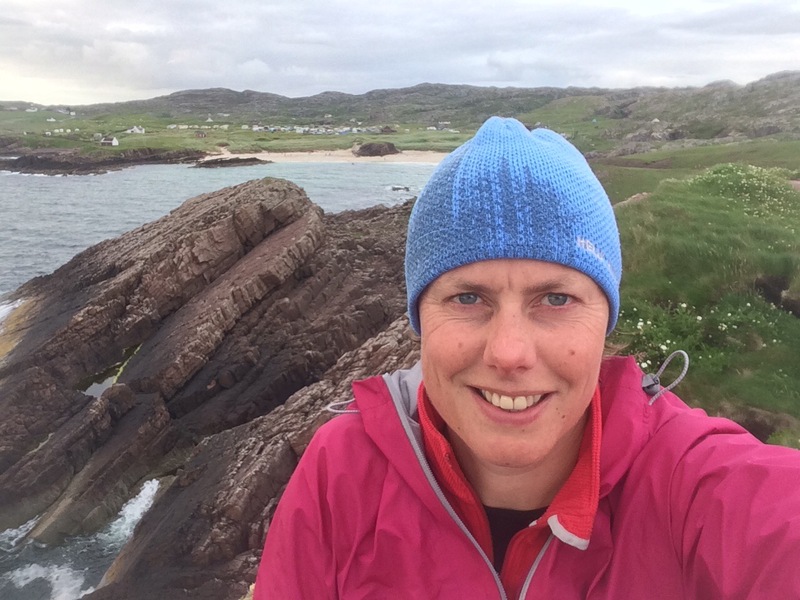 I decided to leave my tent where it was and wait until tomorrow – I do want to get to Cape Wrath. 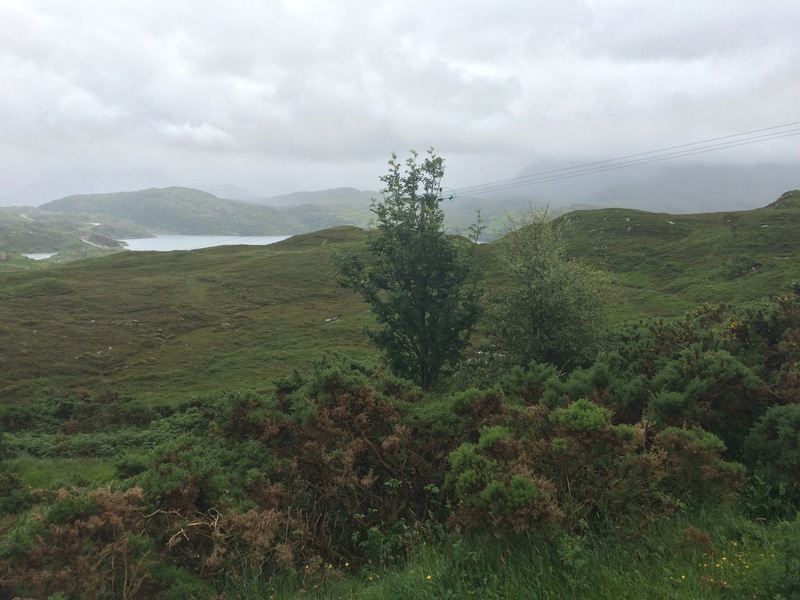 I started driving with no particular purpose and ended up going back to Tongue and then heading South, almost to Lairg, and back North via the road to Kinlochbervie. 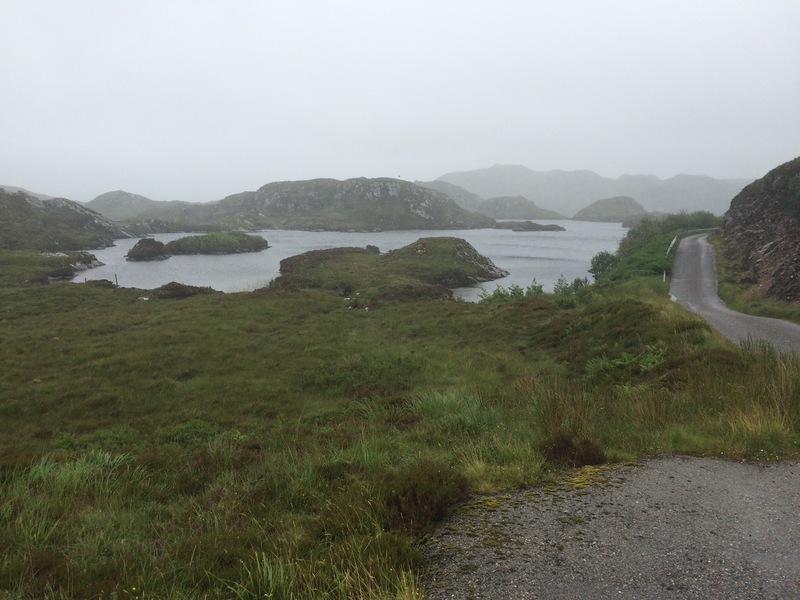 I felt like I was immersing myself in the Highlands even if I couldn’t see much of the scenery. Occasionally I got a decent view and the landscape is amazing, and it changes. Sometimes it’s hilly, sometimes flat and boggy with pine forests being cultivated, and in the far North West the hills become more rocky. I stopped at another empty, soulless and distinctly rubbish cafe on the way South. With so many tourists up here, many of them foreign, I’m slightly surprised the cafes are so poor. 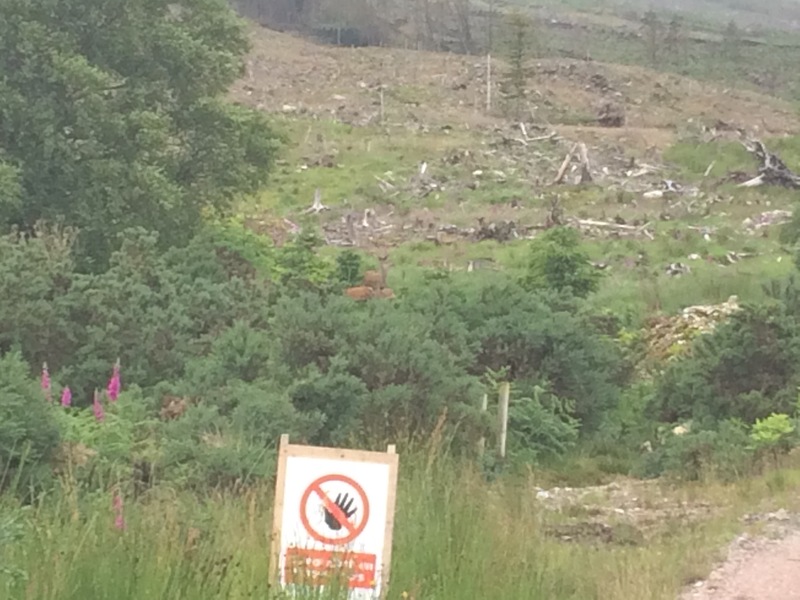 On the way back North I was fortunate to see some red deer in an area that had been de-forested. I also saw a few anglers, although not as many as yesterday, and a few hardy cyclists (who looked drenched). 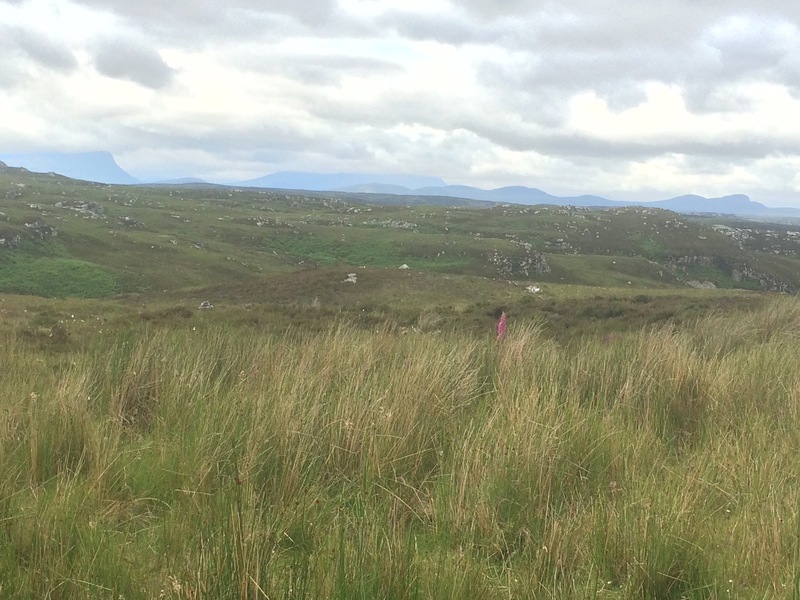 I didn’t see Ben Hope; the most Northerly Munro has not been visible for the past 2 days. Can you see the red deer? It finally stopped raining at 3.30 pm and as soon as I got back to the campsite I went out for a short walk over Faraid Head. 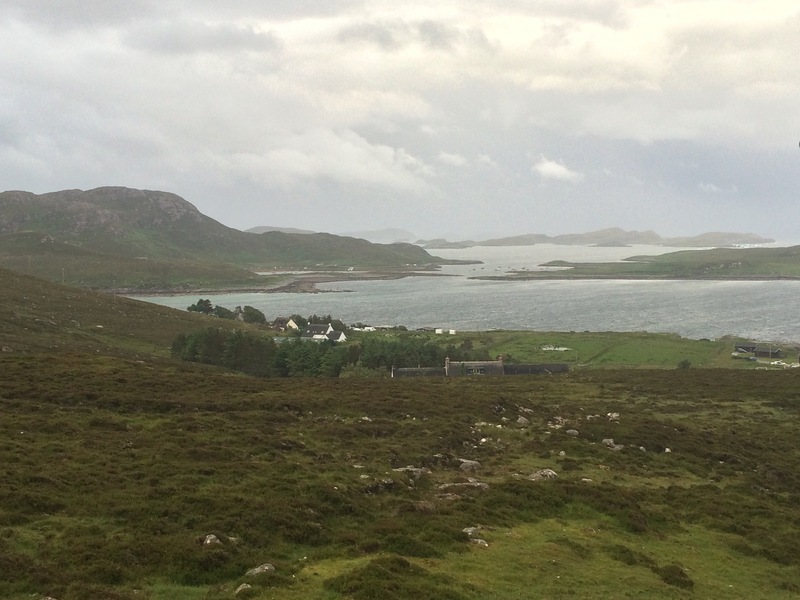 I could see across to Cape Wrath, although it was still dark. 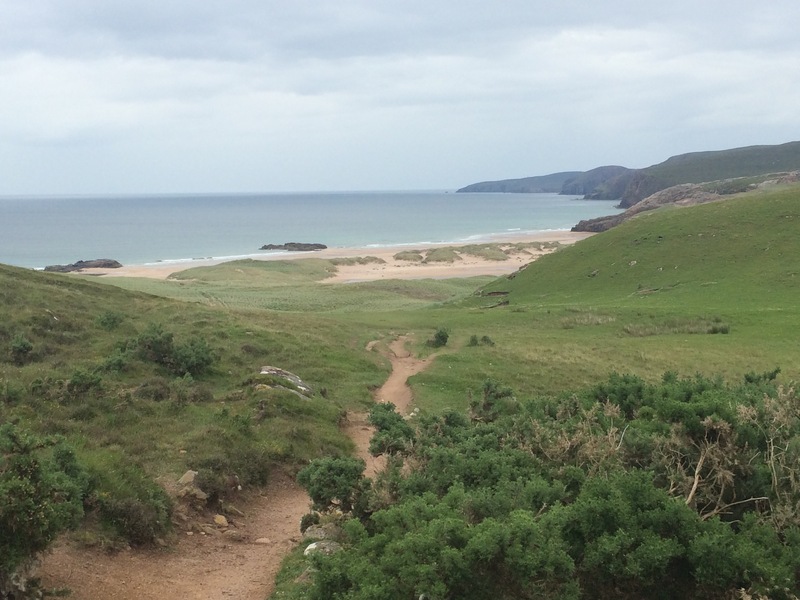 I walked back along Balnakeil Beach and then into Durness. I am hoping for better views tomorrow. I woke up reasonably early and, despite telling myself I could have a lie in, I decided to get up. 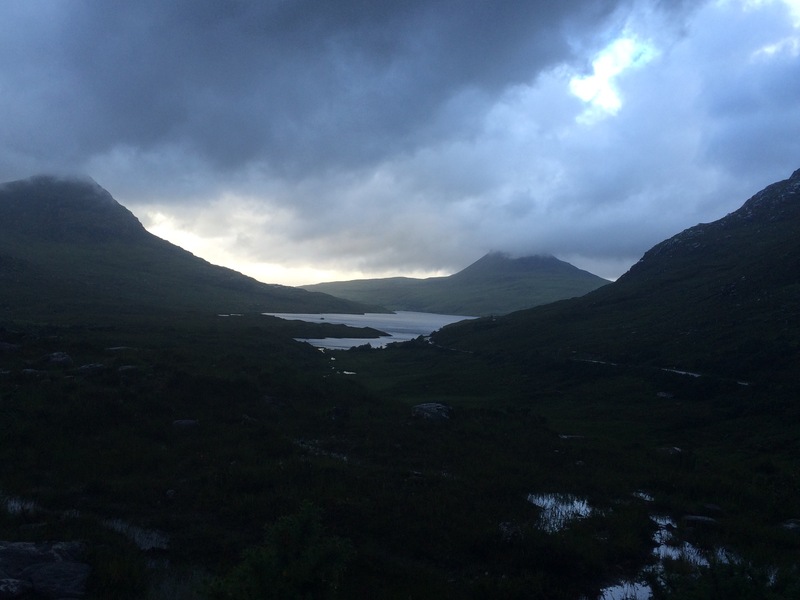 It was a fortuitous decision as the sky was grey and no sooner had I packed the tent away than it started raining. I got in the car and started driving West. 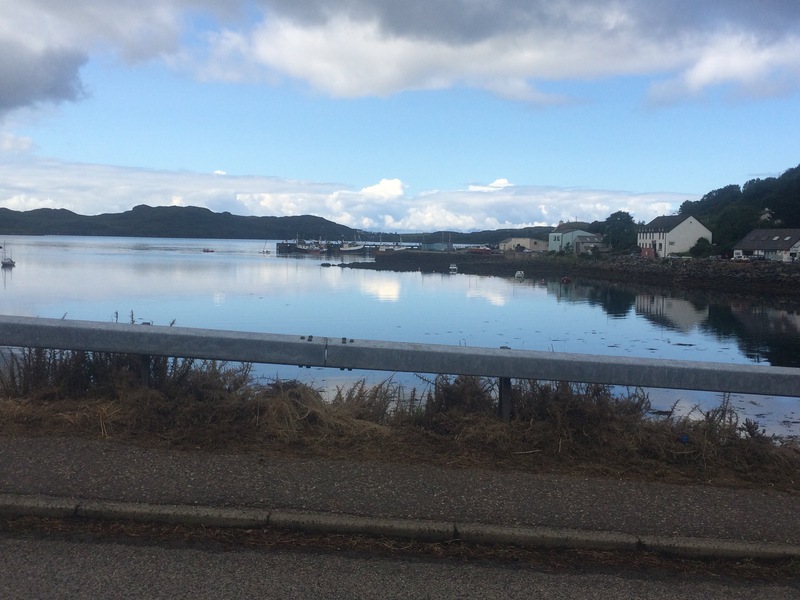 I stopped at Port Skerra so that I could get a better look at Melvich Bay, and I popped into the shop thinking I might get a newspaper. The only decent newspapers were all reserved but it was worth stopping as there was an old man in there talking through some very old photos with some of the locals. Most of them were of 2 very harsh winters in the 1950s and 1970s. The snow was at least 2m deep and a special snow clearing vehicle was brought in to dig the locals out. Interestingly the general consensus was that the last proper winter snow was 15 years ago, when they used to have 4 distinct seasons up here. Now they seem to only have one continuous season; cool and wet. 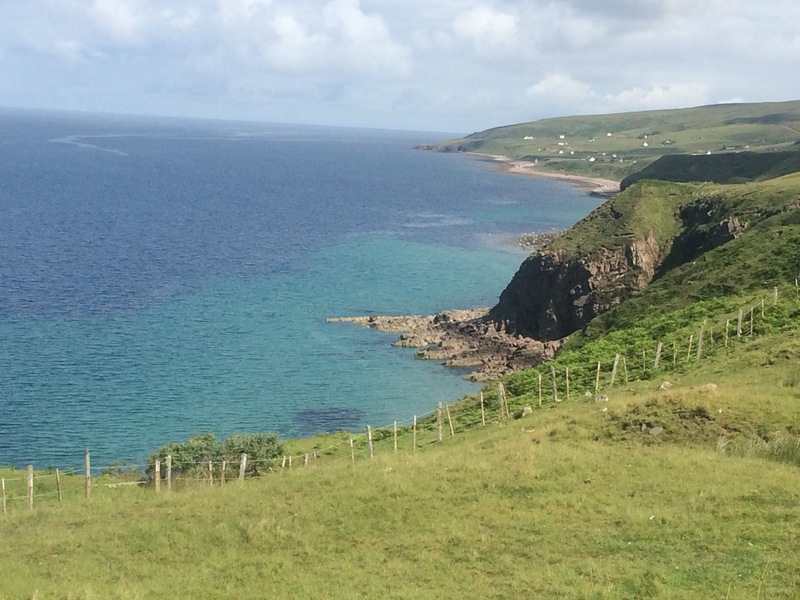 I carried on along the N & W Highlands Tourist Route to Bettyhill. The coastline here is absolutely stunning. 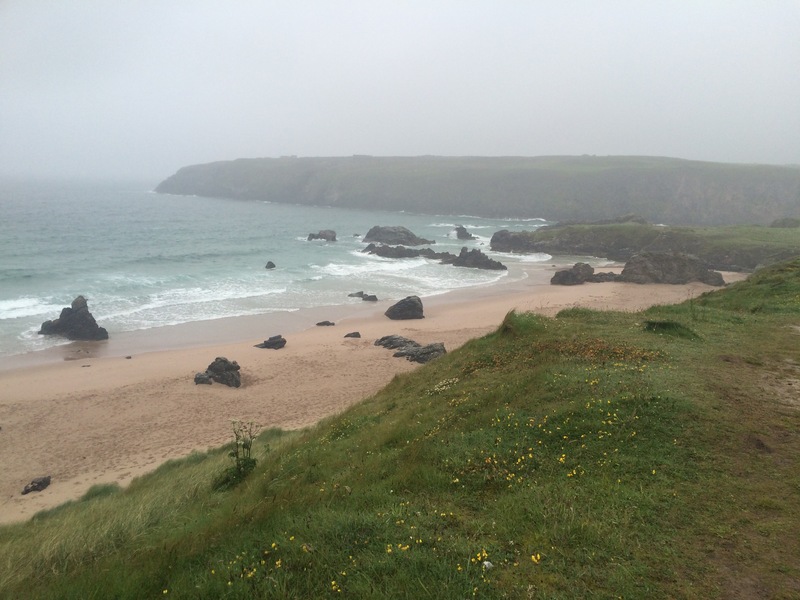 The beaches are like nothing I’ve ever seen with perfect sand, rocks and then a turquoise sea (even in the rain). 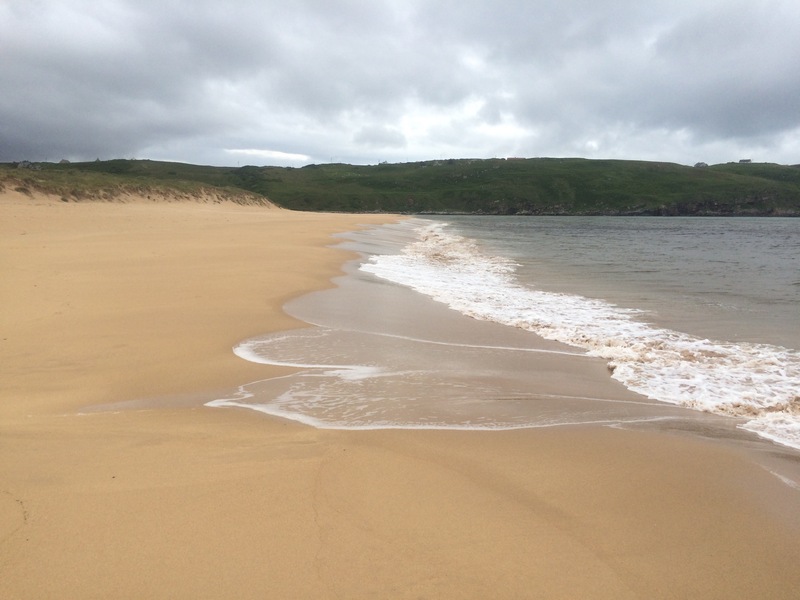 Sadly, as the weather was so poor it was not inviting to get out and walk (although I did walk down to Strathy beach), and certainly not to go for a swim. Due to the rain and reduced visibility I didn’t bother going out to Strathy Point. 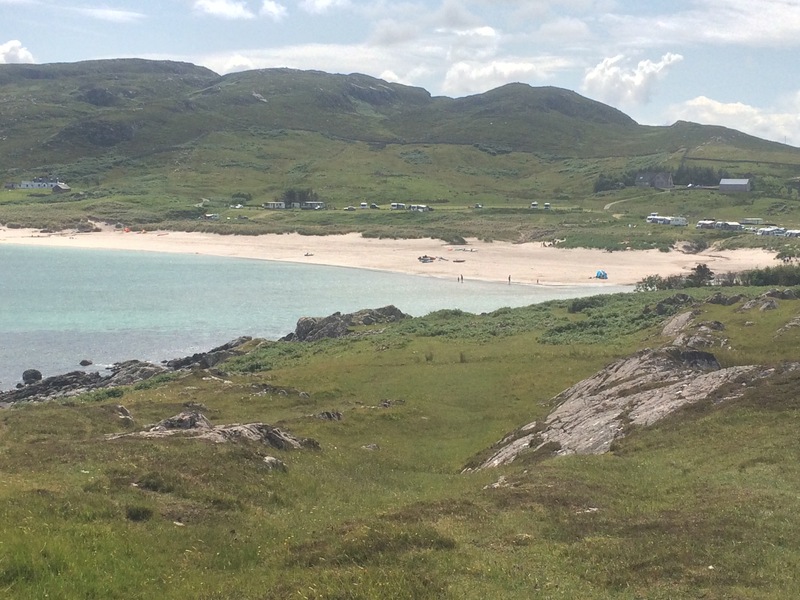 Both Strathy and Armadale Beaches looked amazing. I stopped at the cafe in Bettyhill and travelled back in time to the 1970s. Tea and a cake was below average but I needed a hot drink to warm up. 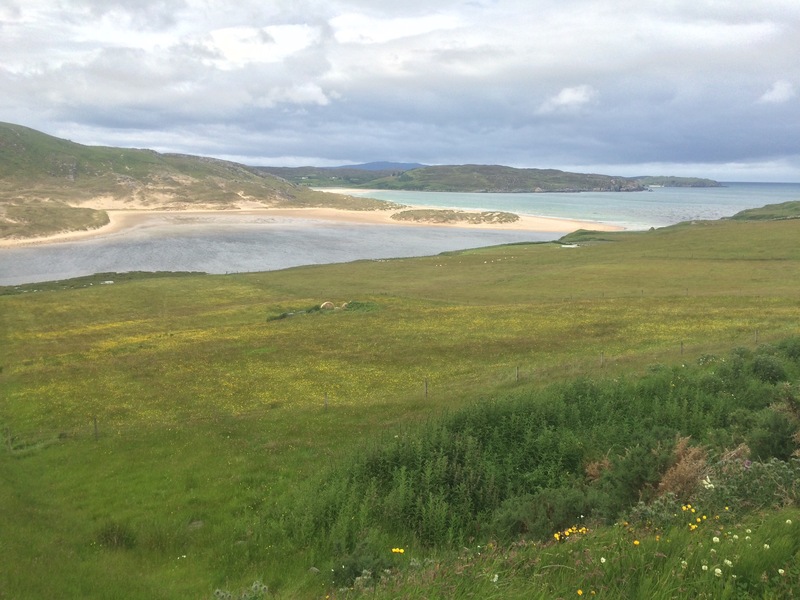 Bettyhill lies just on a corner overlooking Torrisdale Bay. Wow. Two rivers flow out into this bay, one at either end. Beautiful. The road goes up and down a lot as it snakes its way along the coast. I saw lots of motorbikes, campervans and touring cyclists. Most of the road is single track with constant stopping required at the many passing places. Everyone waves. Next up was Tongue. Wow again. 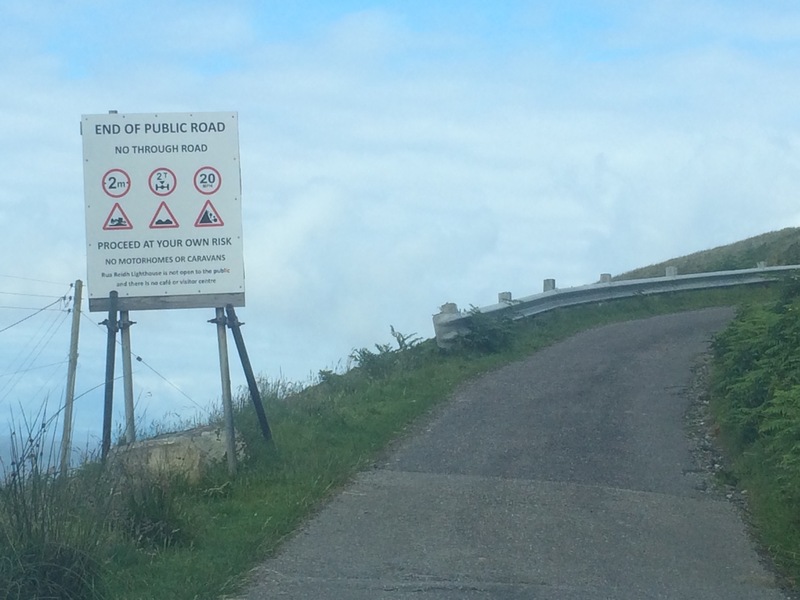 The road starts up high and then switches back as you descend to the bridge across the Kyle of Tongue. Castle Varrich was just about visible on its hill through the gloom. 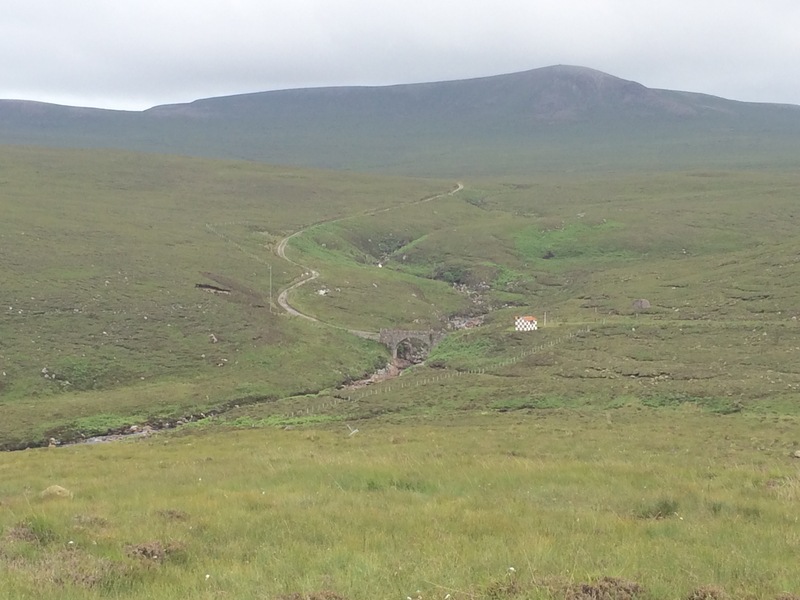 The landscape started to flatten a bit as I crossed the A’Mhoine, which seemed like a moor. 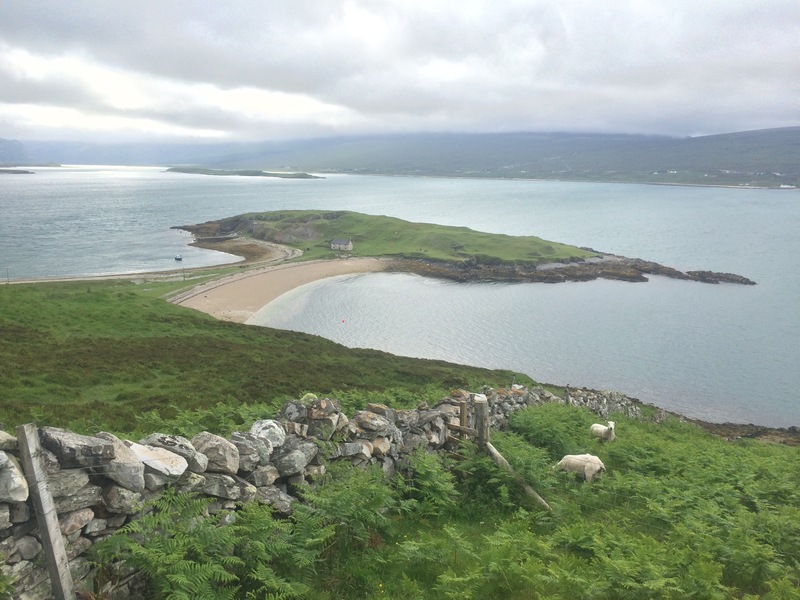 Then I came to Loch Eriboll. WOW. This was my favourite of the day. Simply stunning. Ard Neakie was the jewel in the crown, an ‘almost Island’ that is connected to the mainland by a small spit of land that looked rather like the tombolos in Shetland. There was an old limestone kiln visible on this almost island. 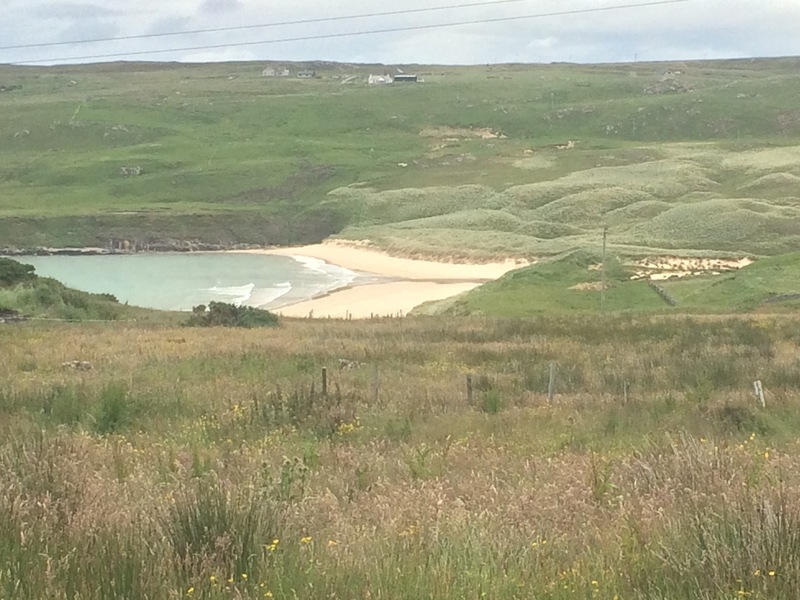 The road ran all the way around the loch and up the West side to yet more beautiful beaches. So many in one day. 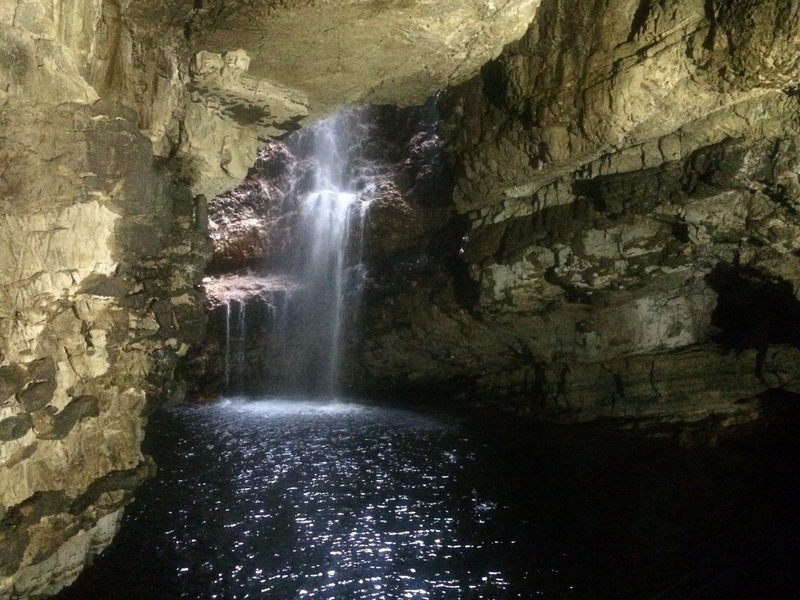 Just before Durness is Smoo Cave. 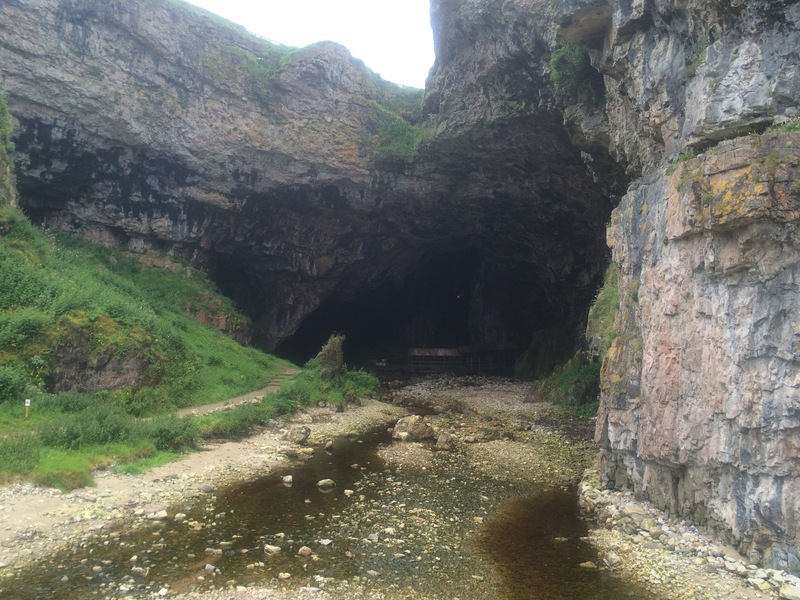 This is a set of 3 large caves that were once used as workshops and as home to generations of seafarers. There are a couple of big blowholes above the caves and the cut in the cliffs leading to the caves is also impressive. I was now in the Geopark: 800 square miles of outstanding landscapes and geological interpretation. I have definitely been blown away by the landscape so far. 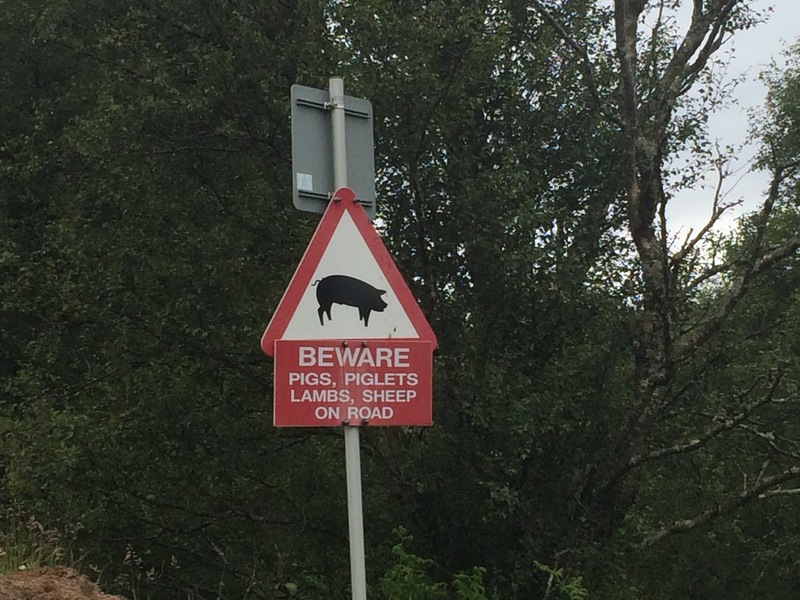 I arrived in Durness and drove through it for a look. 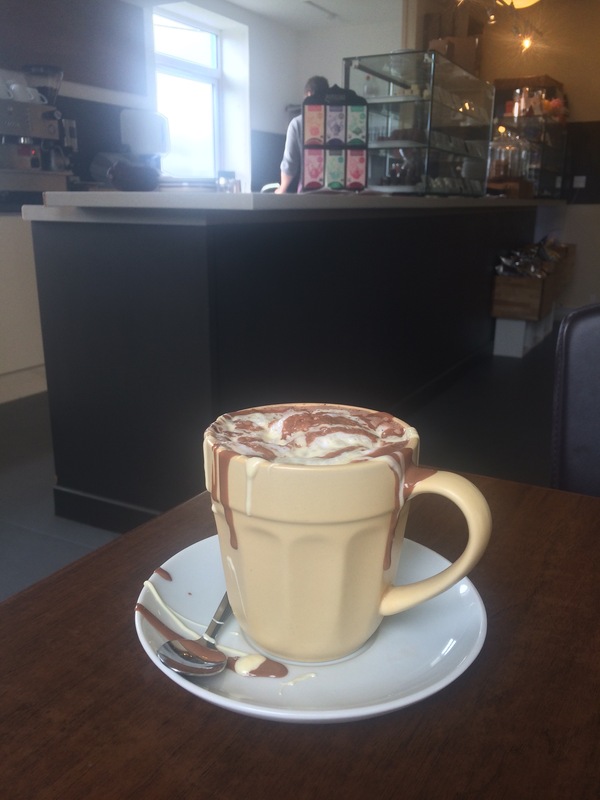 I ended up at the Balnakiel Craft Village and stopped at Cocoa Mountain Cafe for one of their hot chocolates (this place had been recommended to me by a cafe owner in Helmsdale). It was pretty good and very rich. The rain had stopped, although the clouds were still dark and foreboding. 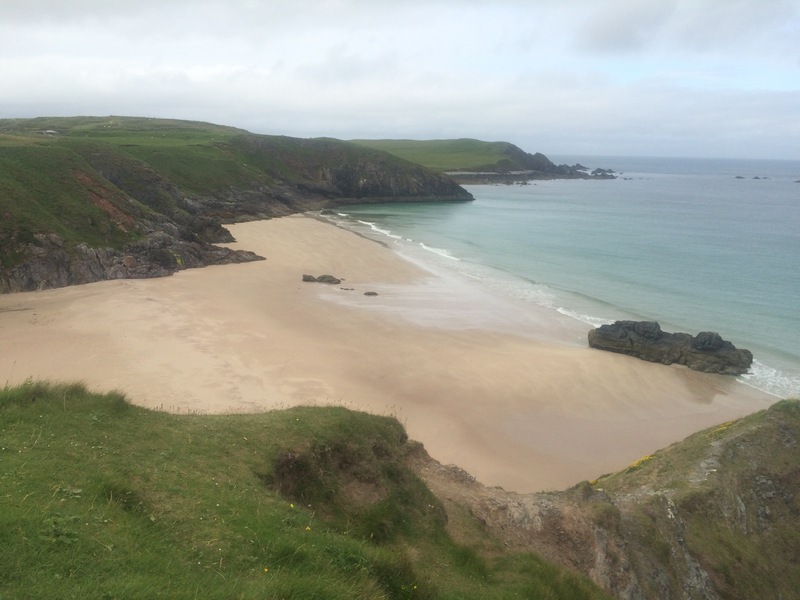 The campsite is right on the cliff top above Durness beach, yet another stunning beach. There were even some surfers in the sea as the waves were decent. I pitched my tent, had a shower and a bite to eat and then settled down for an early night with my book. Inspired by my visit to Dunbeath Heritage Centre I have bought Neil Gunn’s Highland River.